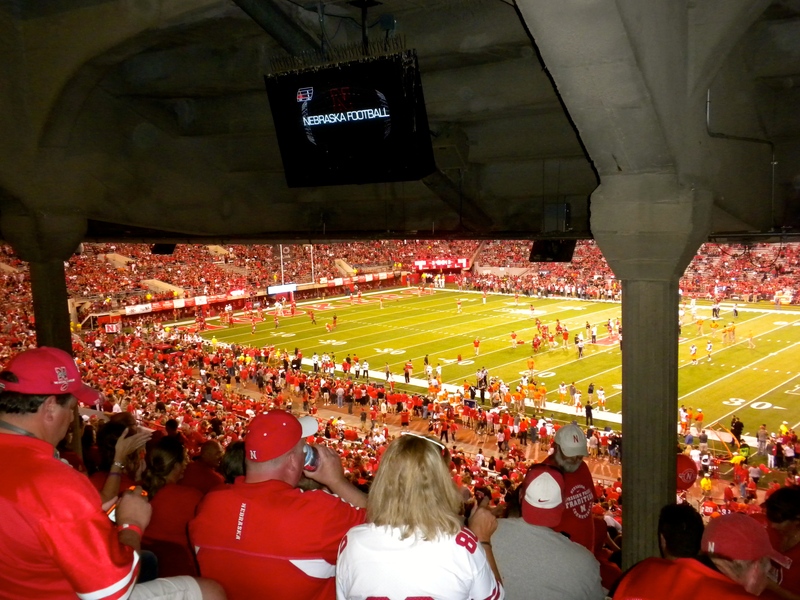 Memorial Stadium, Lincoln, Nebraska – Go Big Red! The next morning we were up early and on the road to Greenwood, NE. We arrived at the Pine Grove RV park, right off I-80, and were given a site near the back away from the freeway, and right up close to the corn fields. I did mention they grow some corn here, right? As it was nearing the end of Sept., it still was surprising to see all the corn still standing in the fields, but it makes for some very nice scenery for us for sure. 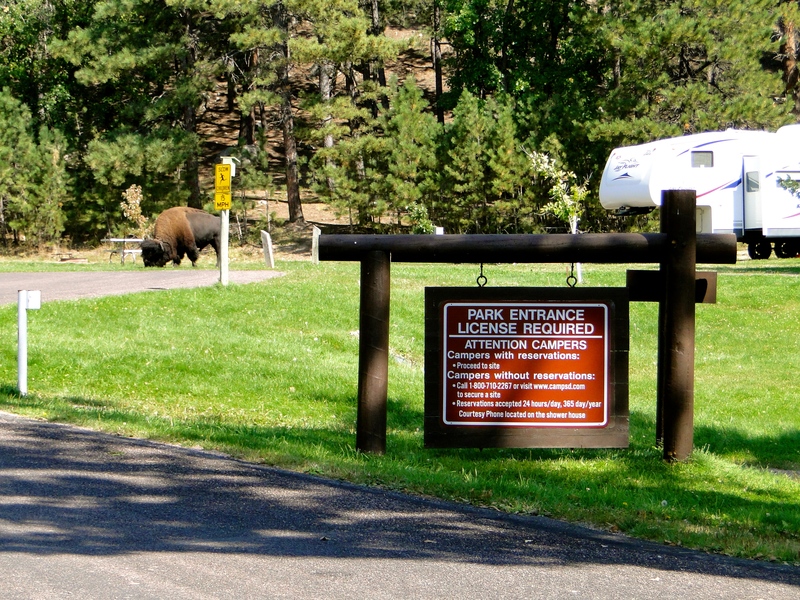 The park was well maintained, with long and open sites, although the roadways through the park could use some TLC. 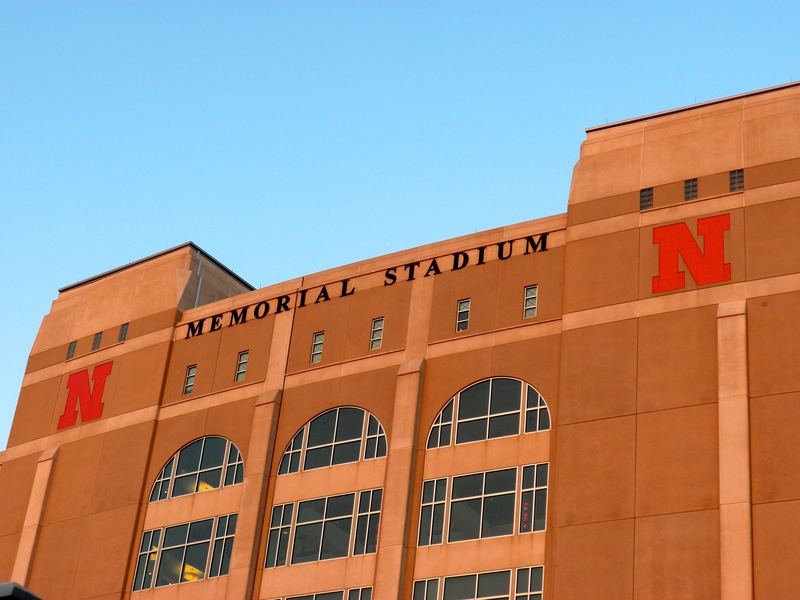 This was to be our home base for the next 4 days, a nice in-between spot for us to visit Lincoln 20 miles to the west, and Omaha 30 miles to the east. Sunday brought the final day of the baseball season, and we chose to stay in and see if the Mariners could pull off the miracle and make the playoffs. Unfortunately the A’s did not get the memo, winning their game and knocking the M’s out of the wild card spot. But, it was great to be rooting for them on game 162; it has been a long time since they were in contention beyond May or June. We stayed in that evening, watched the amazing sunset over the cornfields and made pizza’s, a quiet and relaxing day in the MoHo. Monday we returned to Omaha, and did some more exploring. A much larger town than we had seen in awhile, with a good mix of industry and medium sized high-rise buildings. The Missouri River runs down the eastern side of town, separating Omaha from Iowa. We found our way to the Old Market area, several blocks of restaurants and shops, with cobble stone streets, and huge flower baskets everywhere. 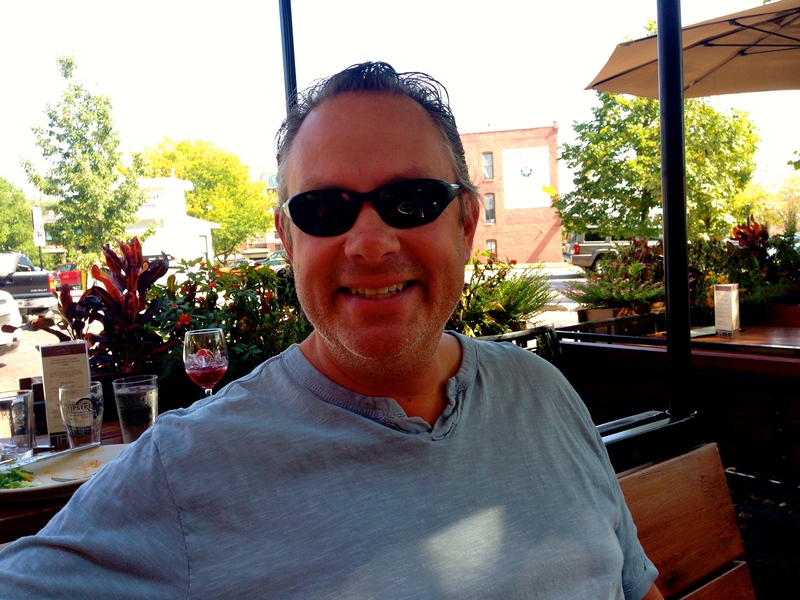 We stopped into a little brewery for lunch and enjoyed our meal at the open air, street side patio. We have really noticed how many of the towns we have visited have similar areas to this, open sidewalks with outdoor seating and a nice vibe for locals and visitors; I guess it is easier to create this type of atmosphere in a smaller town, unlike it would be in a major city. We returned to the MoHo, and started to get ready for our departure the next day, on to Kansas City! 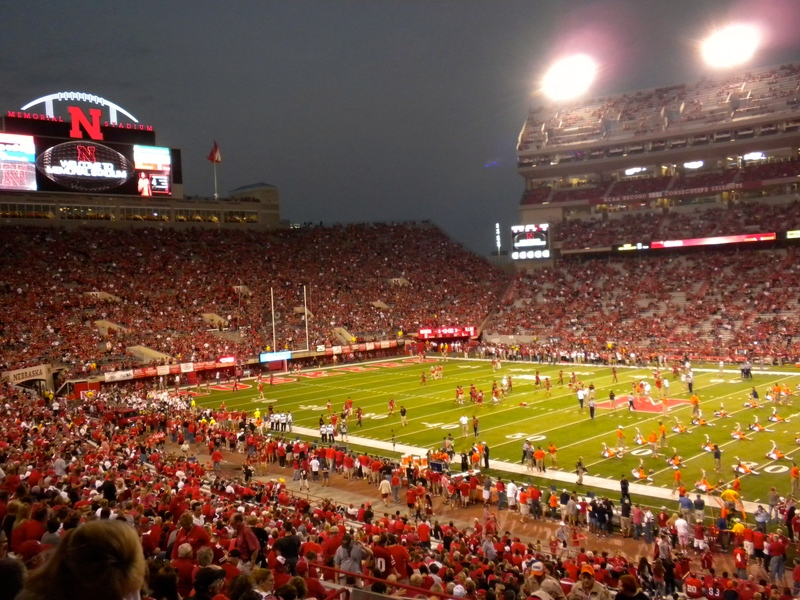 This entry was posted in September 2014 and tagged College Football, Cornhuskers, Lincoln, Mariners, Nebraska, Omaha on October 2, 2014 by Mike. Really Surprised! I was looking forward to this stop because Mt. 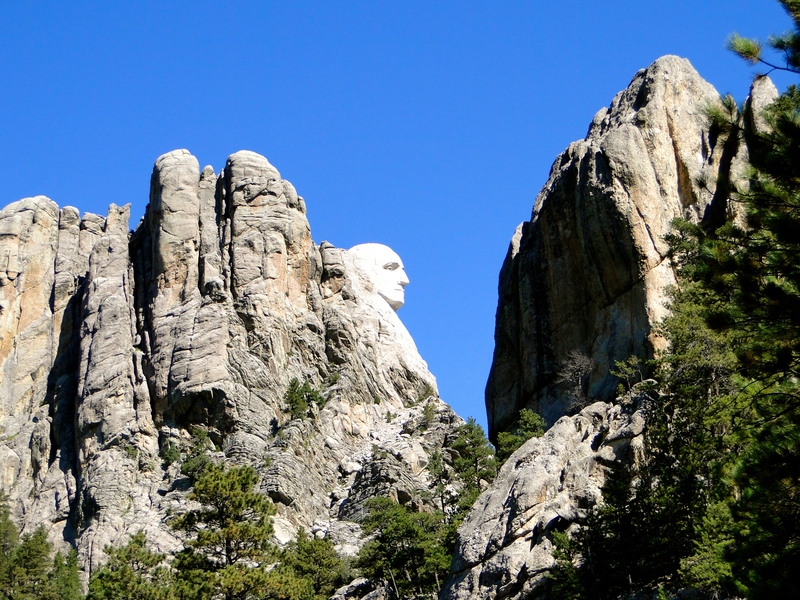 Rushmore was the last big landmark on my list to see, but I had no idea how much more this area had to offer. 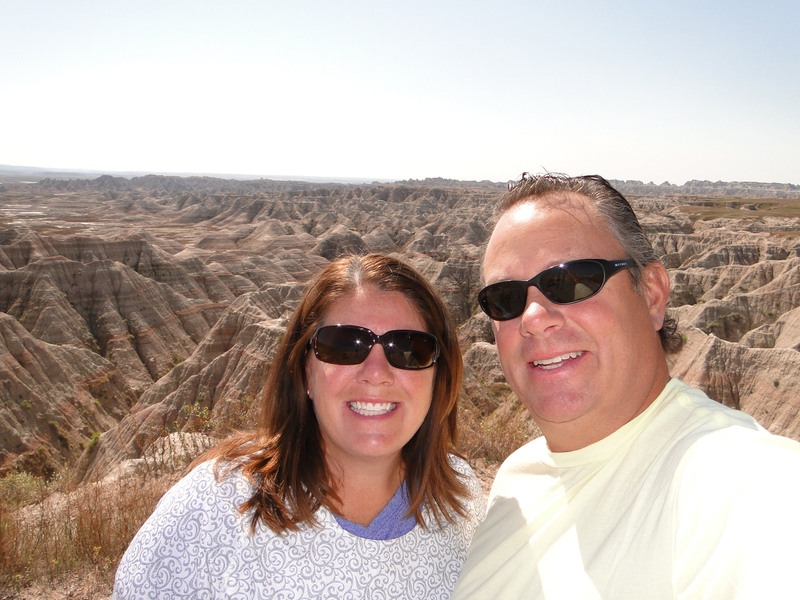 It all started with the perfect place to stay to explore the Black Hills and surrounding area, Hart Ranch in Rapid City (thanks Bob for the great recommendation!). There are dozens of RV parks in this area making it hard to know what is best, so we really lucked out having this great spot. This place was a member park, but since it was the offseason, they had space for us and at a great rate of $32/night. Sites were roomy, onsite restaurant, cheap laundry, very clean, secure, friendly staff and above all centrally located to everything we wanted to see. We originally booked 5 nights here and wondered if there would be enough to fill our time, but we extended not once, but twice, for a total of 11 nights. The weather couldn’t have been better, sunny and in the 70’s/80’s most of the time; it had snowed here just a week prior. I think this area was our biggest surprise of the whole trip, a combination of Utah for unique landscape, Grand Canyon for the awe factor and Yellowstone for wildlife. And, I must hand it to their Visitor’s Association! The guides and marketing materials were very well laid out and easy to use. They had several scenic drives outlined that connected all of the sites and made planning our days more manageable. We saw quite a bit here, but also had some very relaxing days. I loved being in one spot for this long, so we could just settle in and have our ‘home’ setup. The nature of this trip is such that we are on the move a lot and when we have the chance to put down some roots, it really does make a difference. 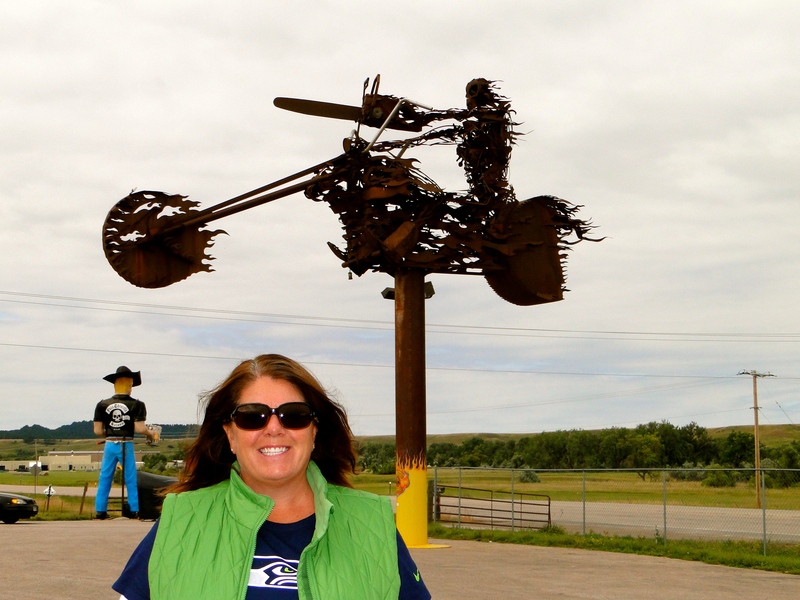 This was a cool town that the HBO show was based on, reminiscent of the gold rush of 1876 and Wild Bill Hickok. It was basically a one-street town set in a valley with steep hills on either side, full of saloons and gambling halls. 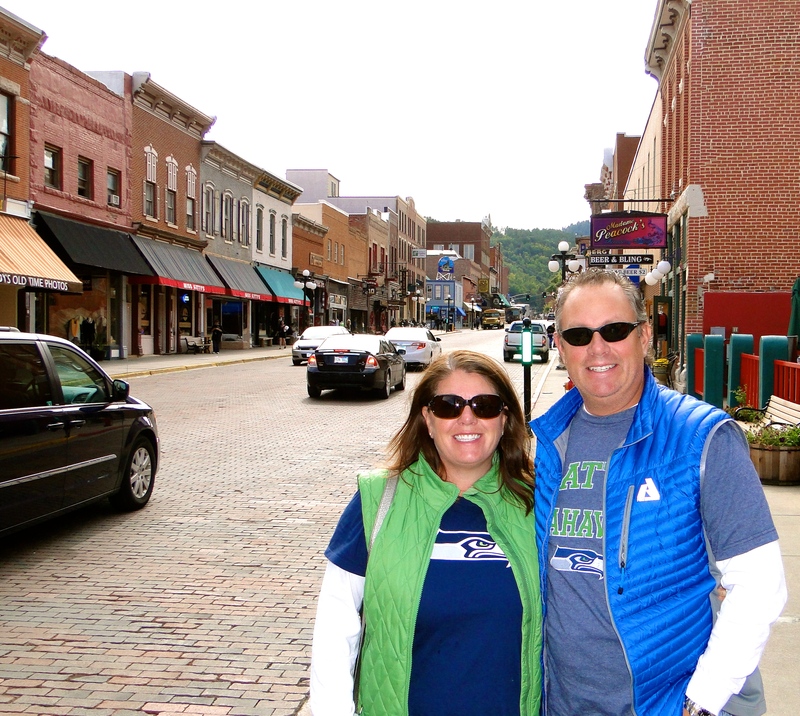 It was Sunday when we were there, so we both had our Seahawks gear on. We watched the Hawks lose to San Diego over appies and a few beers, then decided to try our luck at the tables. Most of the casinos were strictly slots, but we did find a few with tables. 3-card was very popular here, so we sat down at a $2 table with a crew of locals. It’s amazing how much longer you can play when the minimums aren’t $10. Mike actually hit a few good hands to balance out my losing ones and we walked out even for the night. Always a victory when gambling. This town was really fun, a bit touristy, but made for a great day. We missed their annual brew fest by one day, darn. The annual Sturgis Rally had taken place about a month ago, and apparently the weather was pretty bad for them. Next year they are expecting close to a million bikers for the 75th Anniversary. While we were there, it was just another town, actually quite small, but obvious that they cater to bikers. We didn’t go to the Motorcycle Museum/Hall of Fame, as that really isn’t our thing. Instead we just walked around, there was an outdoor moto-cross event going on through the streets, which was kind of interesting. We stopped in at Knuckle Brewing Company for a local beer, then got on our way. I can only imagine how crazy this place would be for the rally. One of the one-way narrow bridges along Iron Mountain Road, nice view huh? 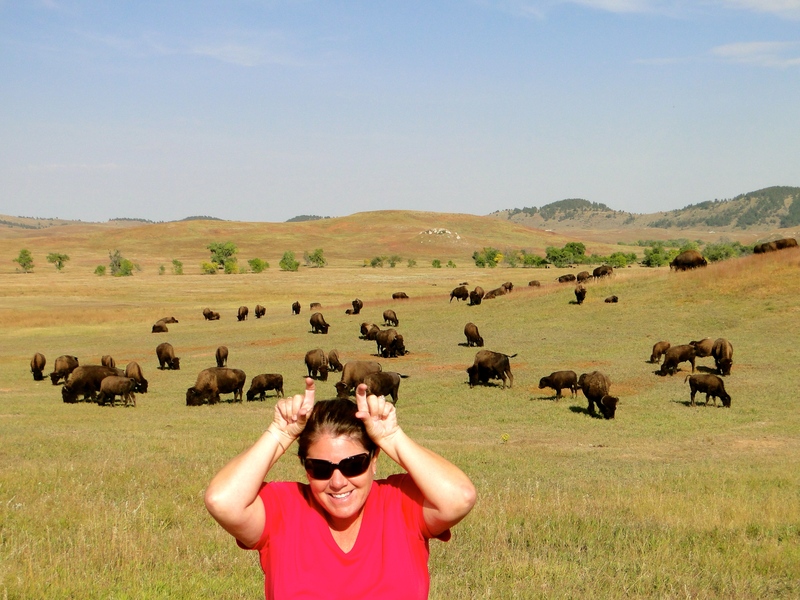 Wildlife Loop Road, my Tatanka impression. 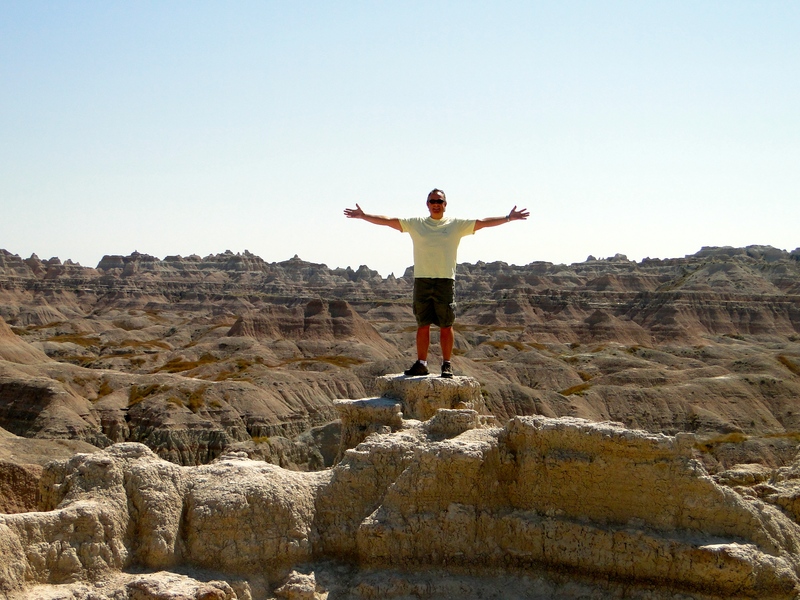 Dances with Wolves was filmed here. 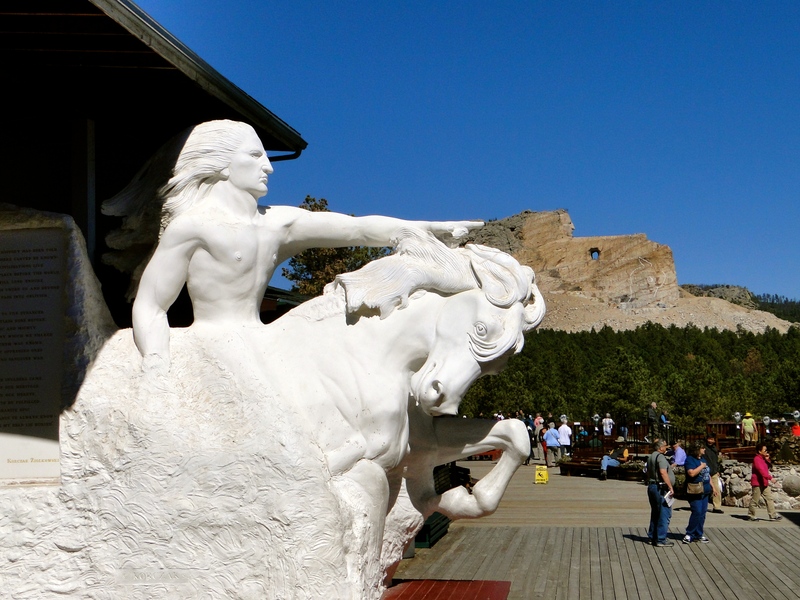 This attraction is known as the world’s largest mountain carving in progress and is a memorial to honor the culture of the North American Indian people. The sculptor started in 1948 and I bet it is only about 5% complete. I’m not sure they will ever finish, but it was very impressive and I think the allure is that it is an ongoing project that is constantly changing. Family members and supporters are continuing the project to ultimately create a statue that will be 641 ft long and 563 ft high. 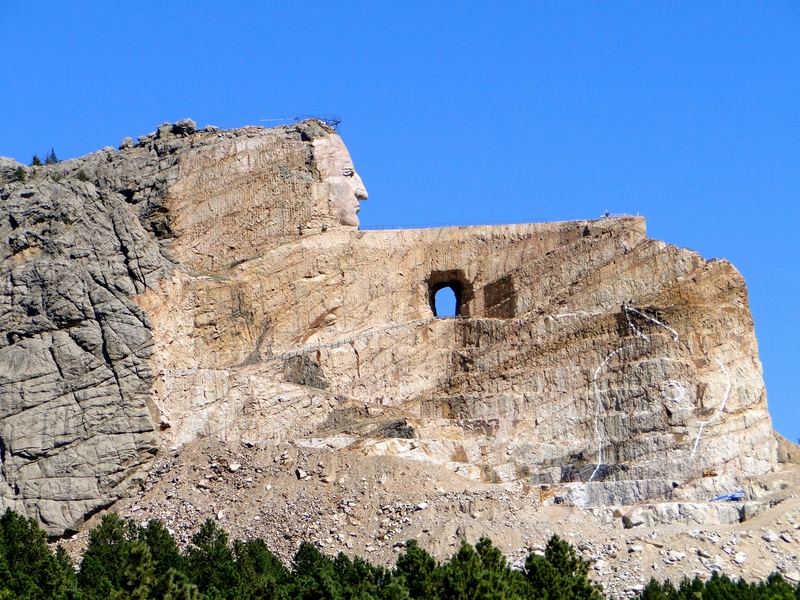 The face of Crazy Horse was completed in 1998 at 88 ft tall and they are now focusing on the 219 ft horse’s head. 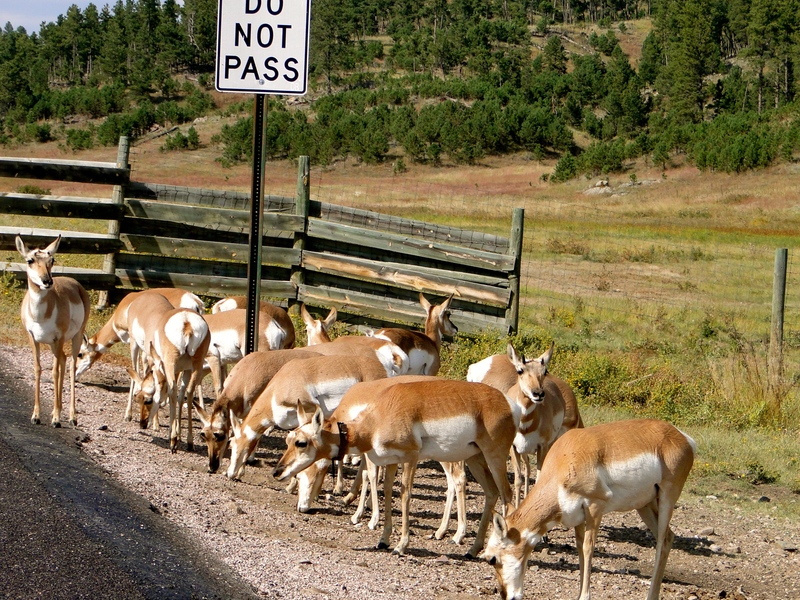 They operate solely on private donations and visitor entrance fees (no public funding), so I’m sure that it why it is a slow go. The surrounding visitor center was impressive and full of native art and history. We had to drive about 90 minutes east to get to the park, but worth it! We entered through the NE entrance and were able to use our annual pass to save us the entrance cost. Immediately there was a pullout that showcased this amazing scenery. 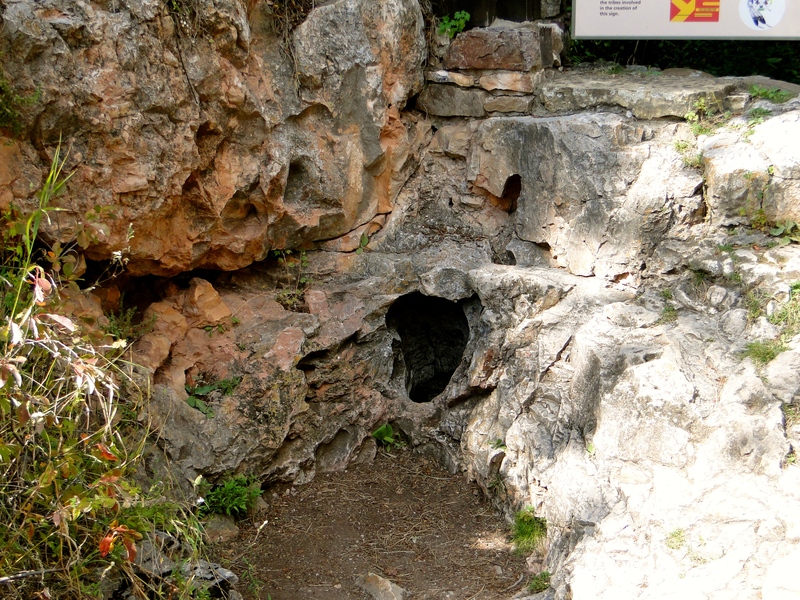 It just dropped down into a hole, kind of like the Grand Canyon, with sheer cliffs all around. 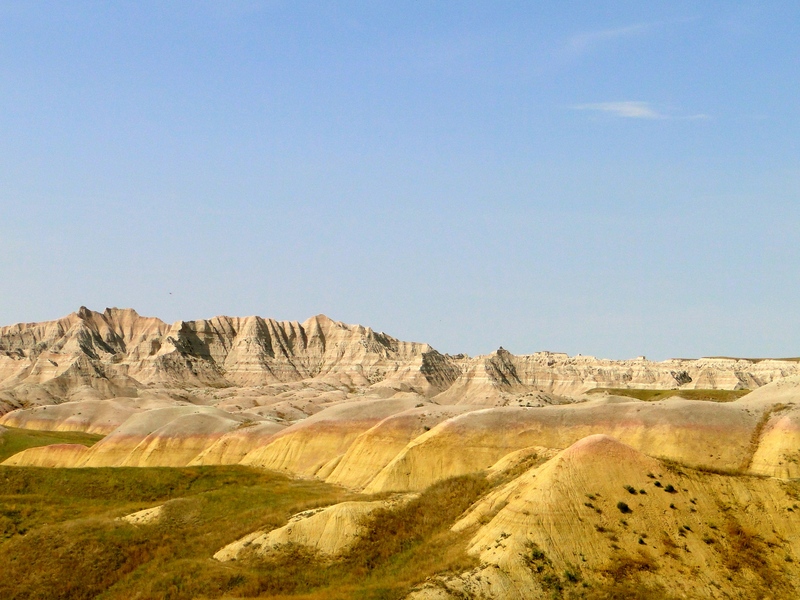 The colors of the walls were striped due to the minerals in the stone, making for jaw dropping views. 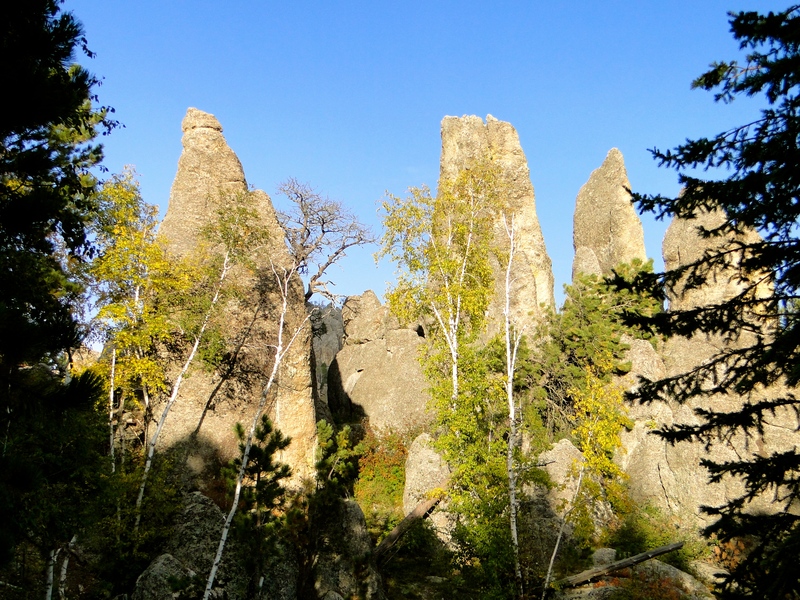 A perfect description from the park brochure was “a striking landscape featuring a maze of buttes, canyons, pinnacles and spires.” We continued to another spot and did a hike out along what looked liked sharp pinnacles rising up from the canyon floor. 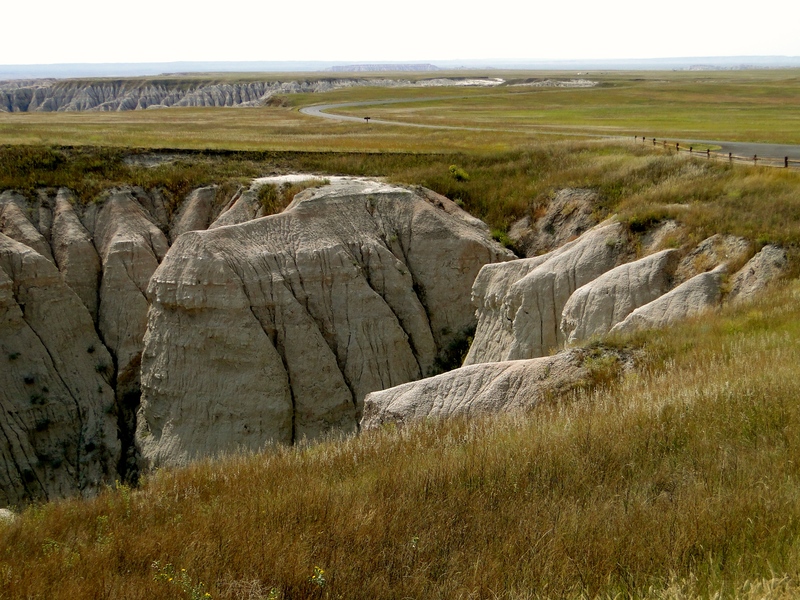 From afar it looked like people were standing on narrow ledges, but once you got out there, the landscape had shallower little valleys to get around on. It felt a bit like walking on the moon. The heat really started to intensify and we were both cooking. After the hike, we continued by car along the scenic drive through the park and pulled out at many scenic points, my favorite being the Yellow Mounds. The colors were awesome. 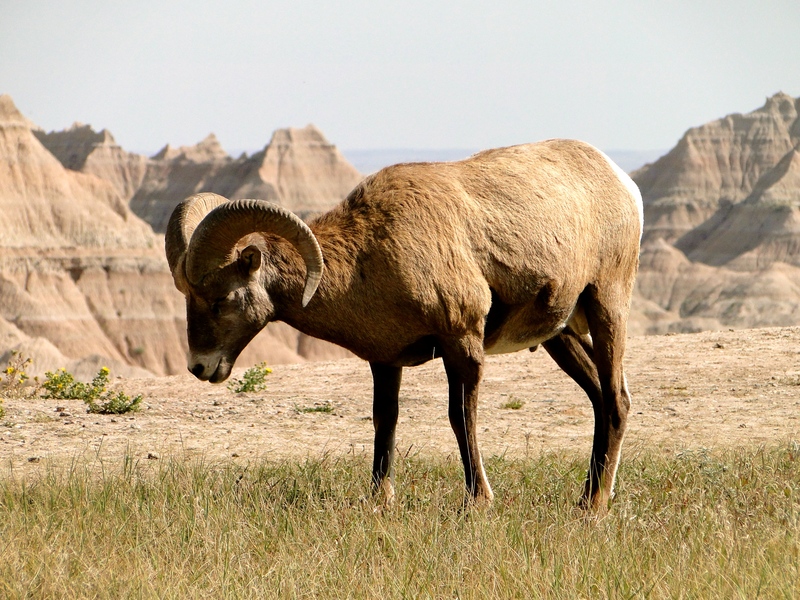 As we headed out of the park, we took another side road and bam, we saw Bighorn Sheep and Buffalo. 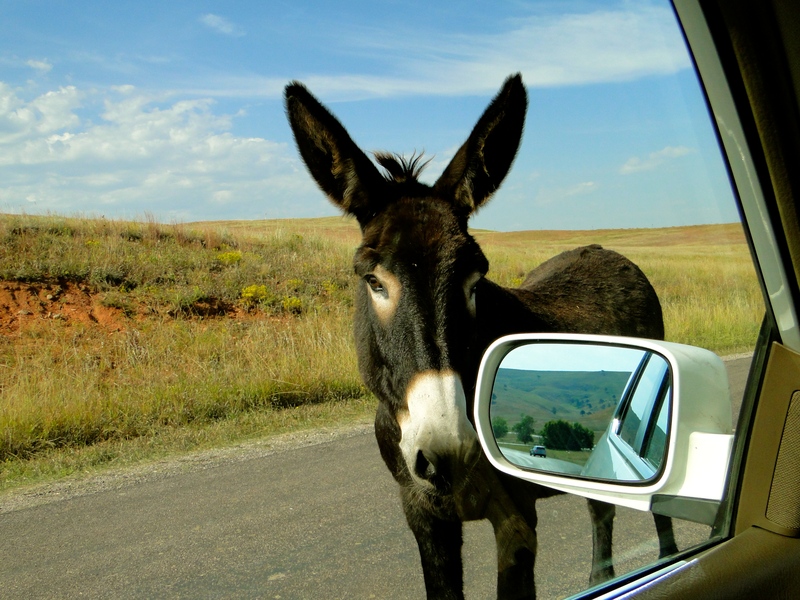 We stopped at Wall Drug on the way out and it was kind of a dud. Basically a lot of trinkets and trash, but had to stop at this iconic place that I had always heard about. 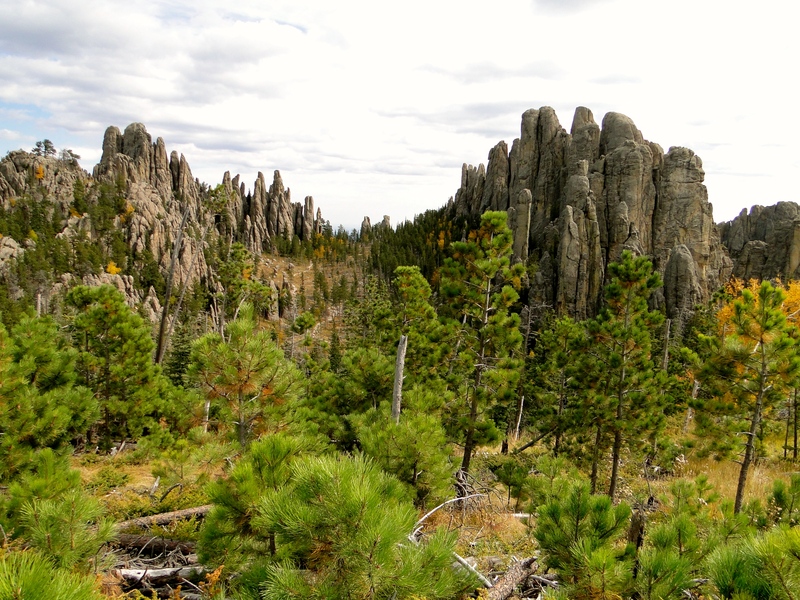 We really liked this National Park, it seems a bit underrated for the spectacular scenery that it has! Mike on top of the world! We saw this iconic attraction multiple times on our stay here, but the best was my first glimpse. We were driving up the hill out of Keystone and there it was off in the distance as we rounded a corner. I think I said to Mike, “that is so cool!” Something I had seen so many times in print or on screen and now to see in person was pretty spectacular. 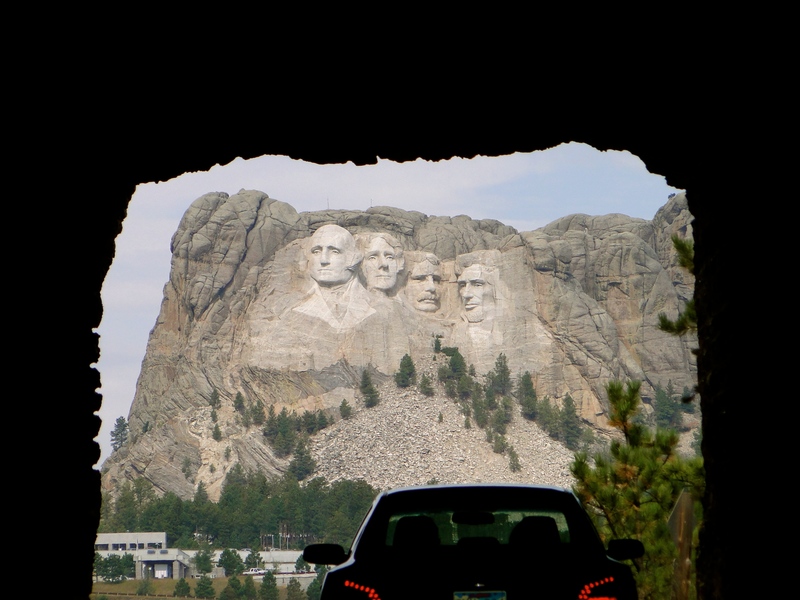 We saw it many more times from different viewpoints while in the car, but the day we actually went into the monument was pretty awesome. We got there around 8am and so glad we made the effort to get there early before the masses/tour buses, plus the light was better so that the faces weren’t shadowed. We had the viewing area pretty much to ourselves. 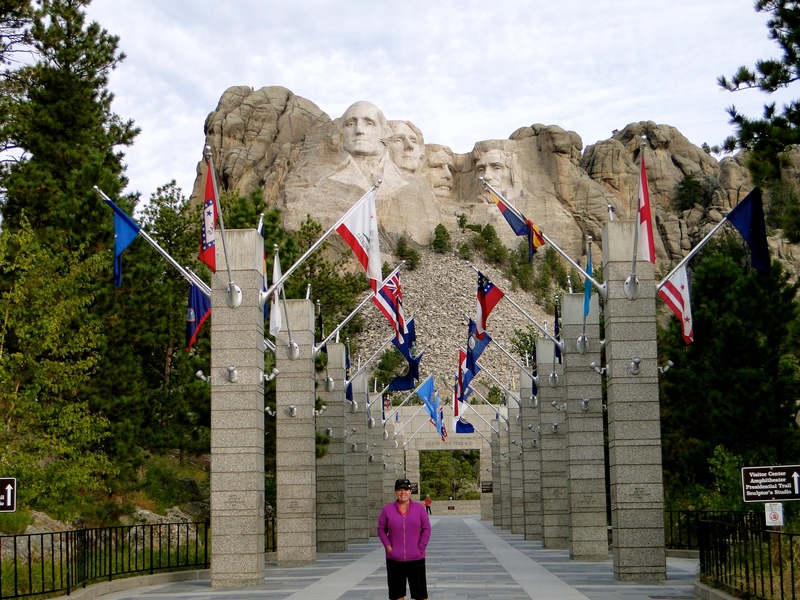 We did the walk around the Presidential Trail for the most up-close view available and Mike was a photo-taking fool. He got some great shots! 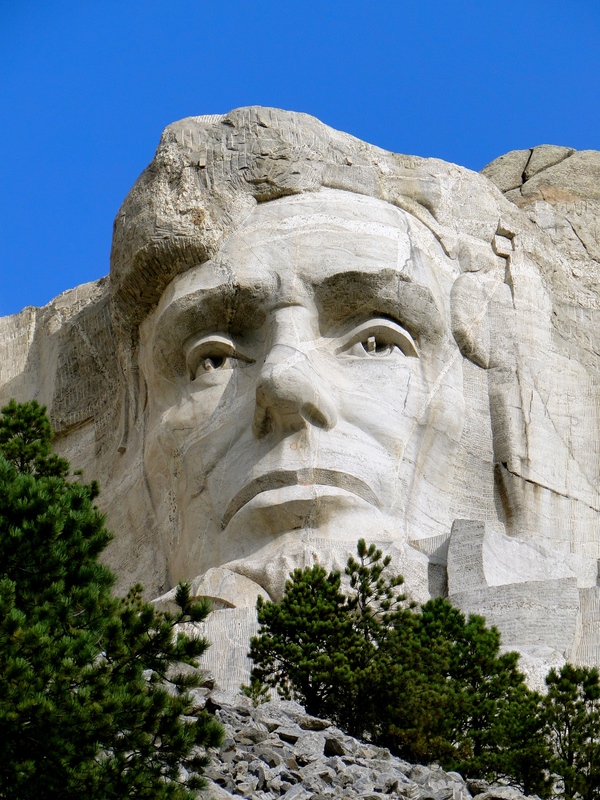 What struck me the most I think is how realistic the carvings were, pretty impressive considering the tools and resources the artists had back in the 1920/30’s to sculpt at such a massive scale in granite. I am baffled how they kept their perspective while carving so up close for something so huge. 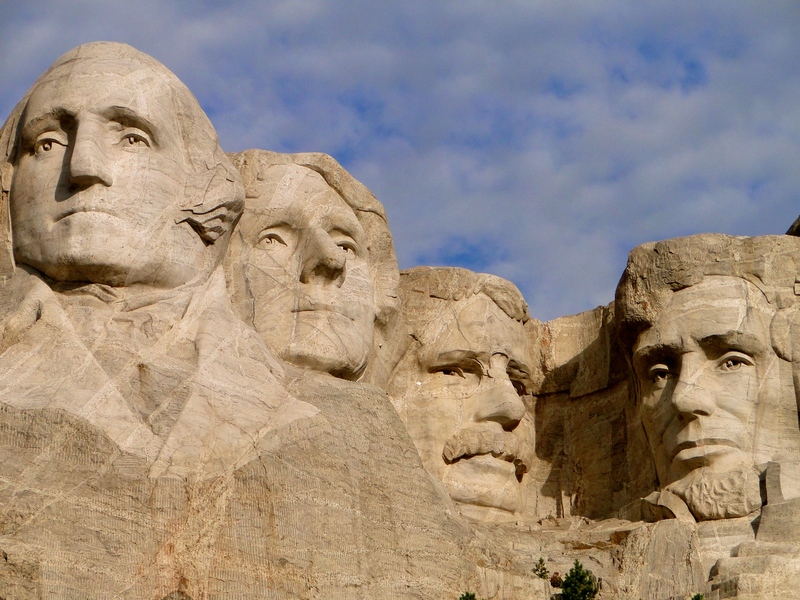 Photobombed by George, Tom, Teddy and Abe! The day we drove to this park, we weren’t sure what to expect. 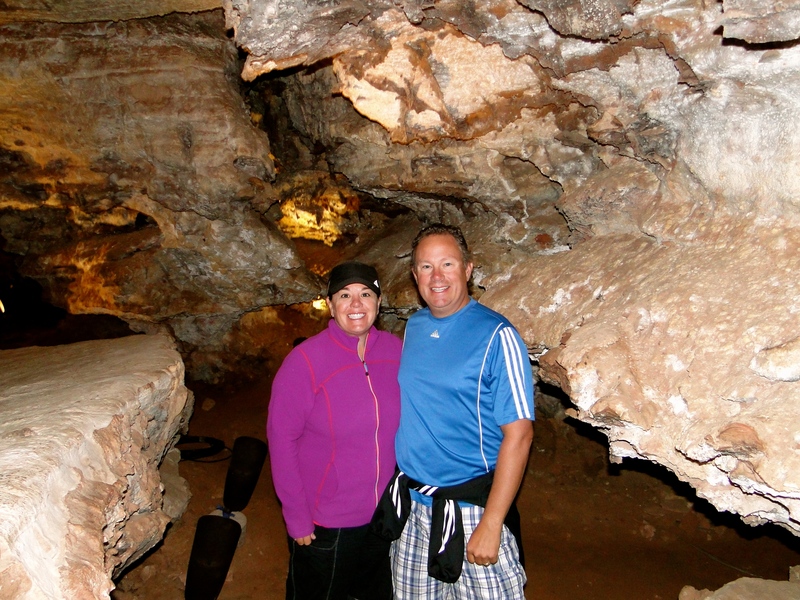 We got to the park and the only way to see the caves was to pay for the $12 tour. We typically prefer to explore on our own, but we figured since we drove all the way to see it, we should go for it. And, so glad we did. It was like nothing I have ever seen before or experienced. 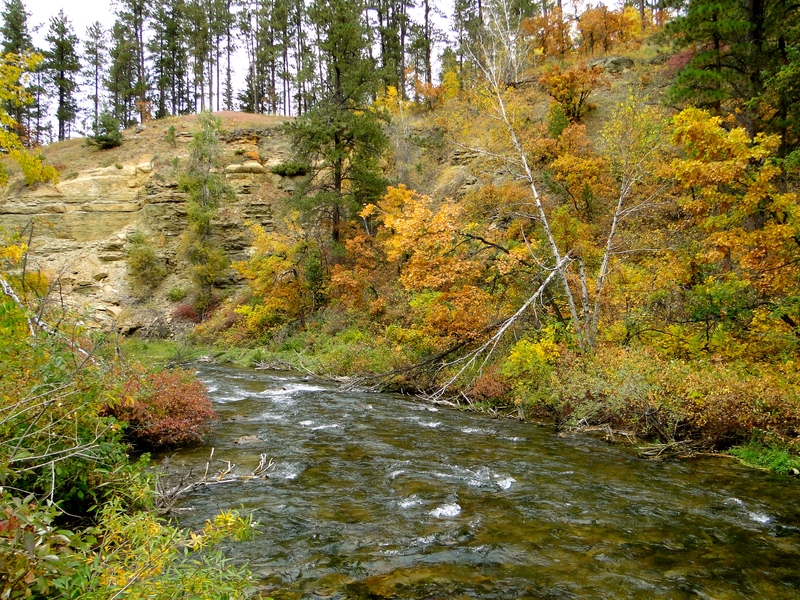 It is one of the nation’s oldest parks (7th), becoming part of the park system in 1903. 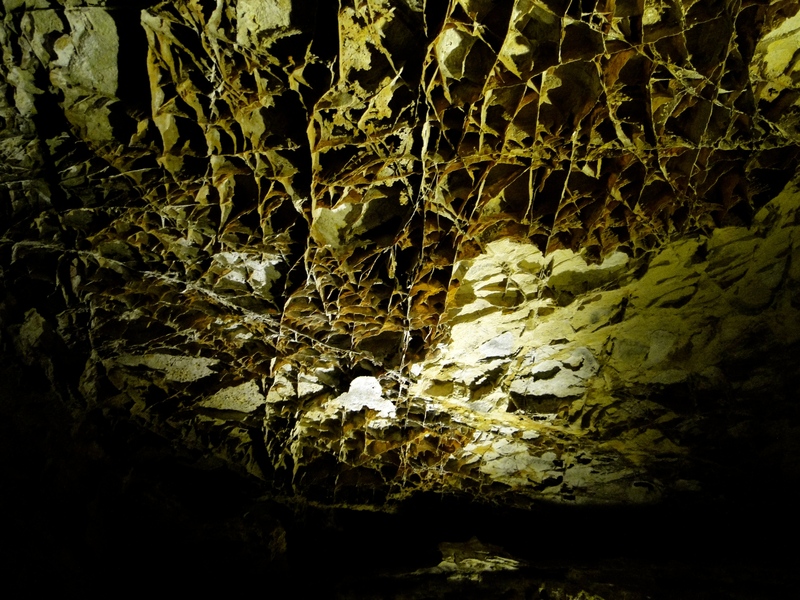 The cave system is approximately one square mile with over 140 miles of explored passages and growing as they continue to explore and map. The Park Ranger told us to imagine it as a cube with multiple levels of passages within it. The tour was about 75 minutes and well worth it. There was a concrete path with handrails and lit areas showcasing the walls. 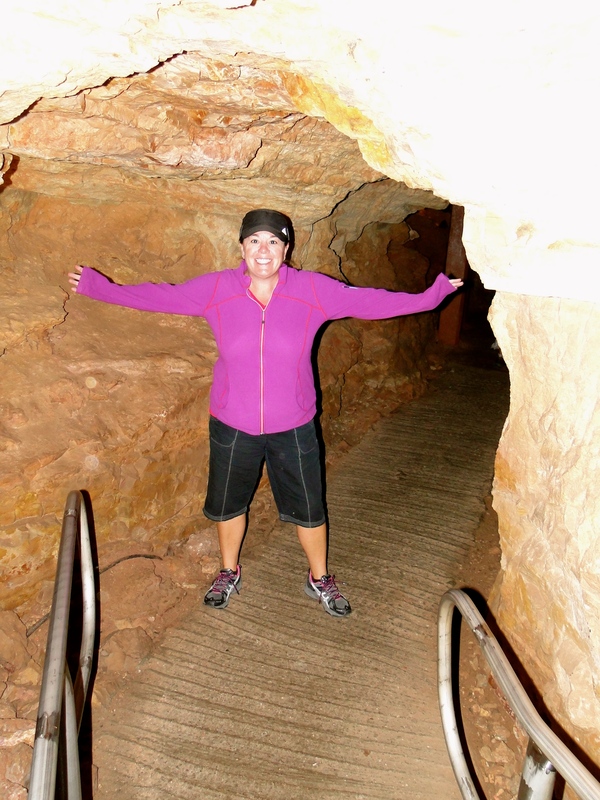 Our tour took us through narrow, low walkways, then into larger “rooms.” The walls and ceilings were full of boxwork and popcorn formations which are very rare and only found here and in some cave system in Europe. We were both so impressed with the tour and blown away by this unique park. 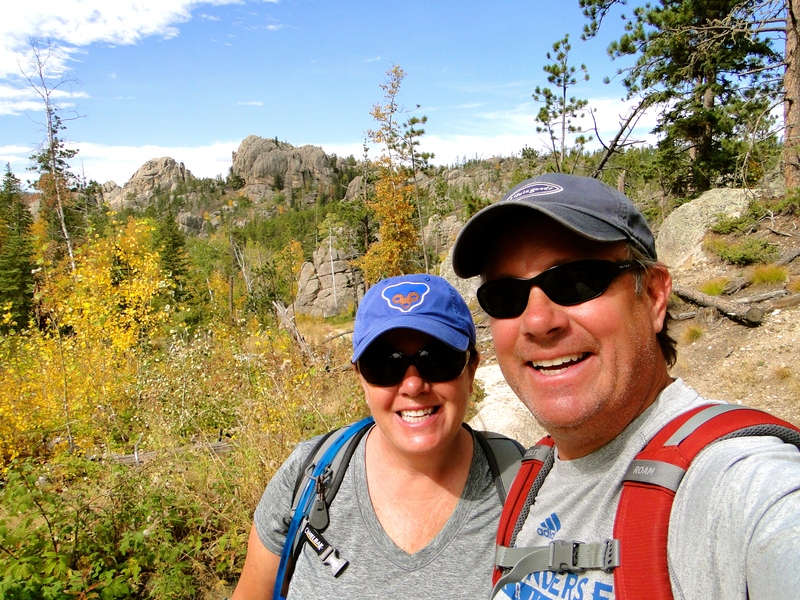 One day, we ventured back to Custer State Park for a hike we had seen on our earlier drive. 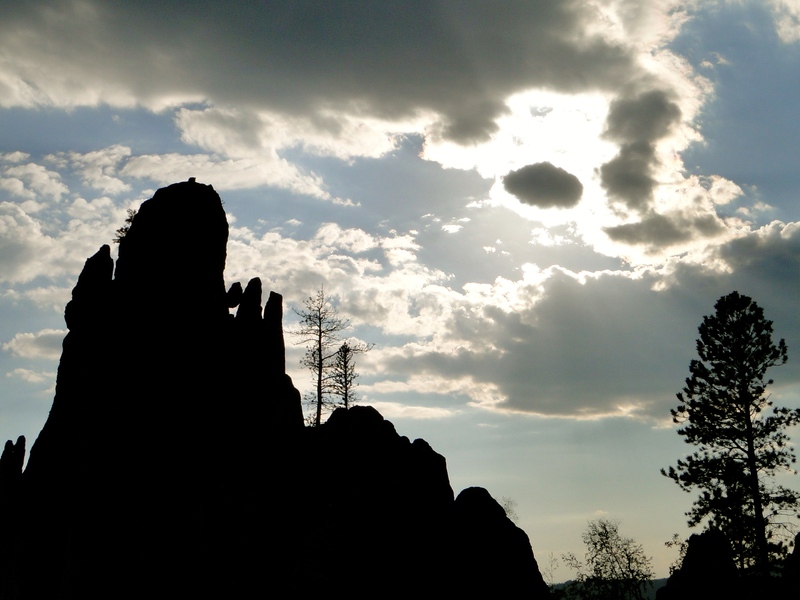 We did about a 3-mile hike up toward Little Devil Tower with spectacular views of Harney Peak. This is the state’s highest elevation point at 7,242 feet. There was a route to the top, but it was considered strenuous and we weren’t up for it on this hot day. The one we did was a gradual uphill climb, moderate, but felt about right for our current condition level. Since it was the off-season, we saw few other people, which is a refreshing change from other hikes we have done that are packed. 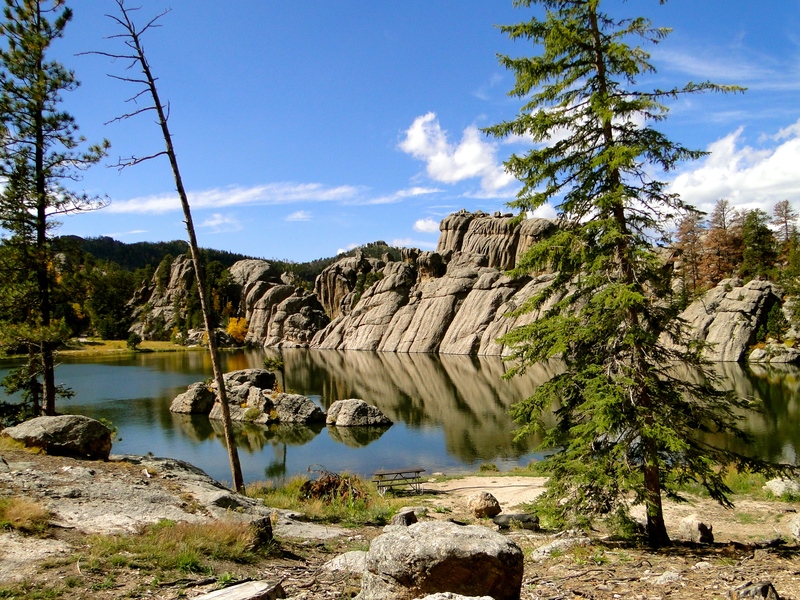 This was a hidden gem that we found on our exploration of Custer State Park. 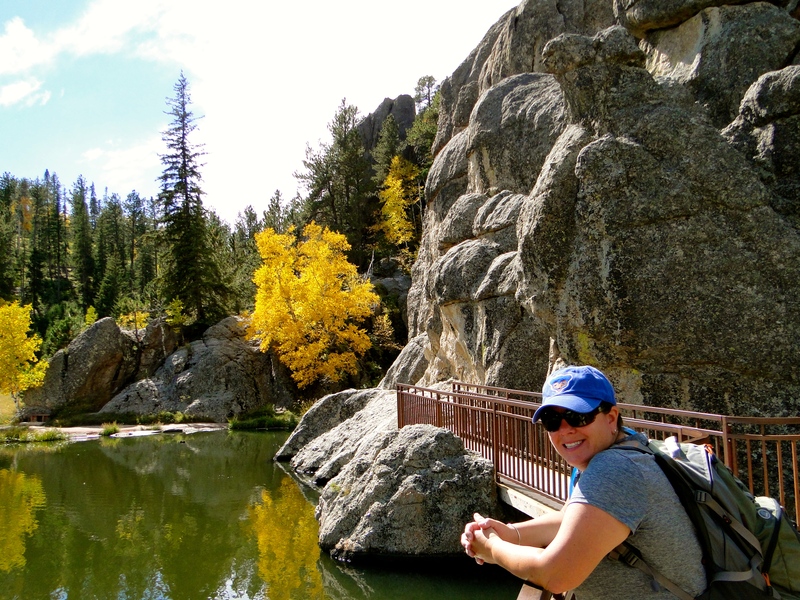 It is a man-made lake with a nice loop trail around that we walked and really enjoyed the peaceful setting. There was even a wedding taking place on the shore while we were there. A pretty sweet spot! There was a golf course affiliated with our campground, just about a mile down the road. We drove by it often and it never seemed too busy. 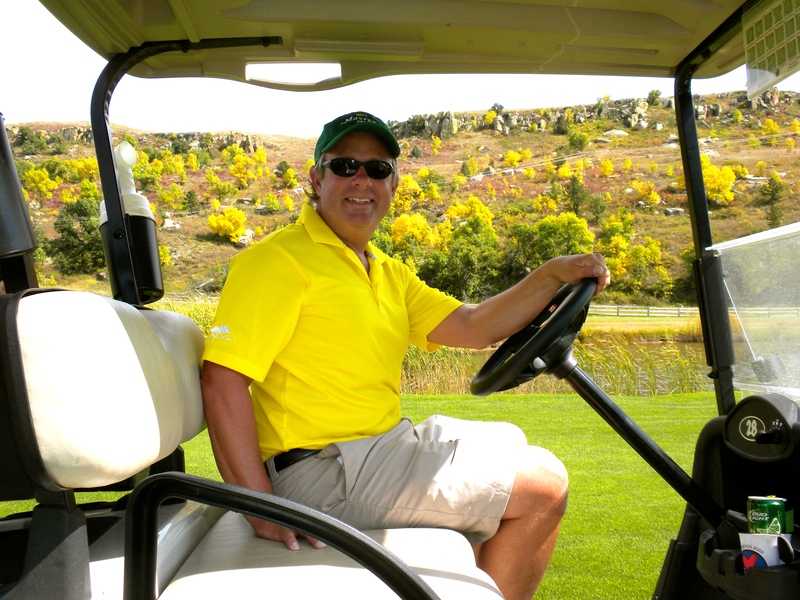 We hadn’t golfed for months, so it was a nice break for us from the sightseeing. We were able to go out just the two of us, which I loved and we weren’t rushed at all. Neither one of us golfed that well and by the time we got off the course it was toasty and we were a bit overheated. But, worth it and the setting of the course was beautiful. Mike matched the Fall Colors! By far, we saw the most wildlife here than we have seen at any other place we have been. 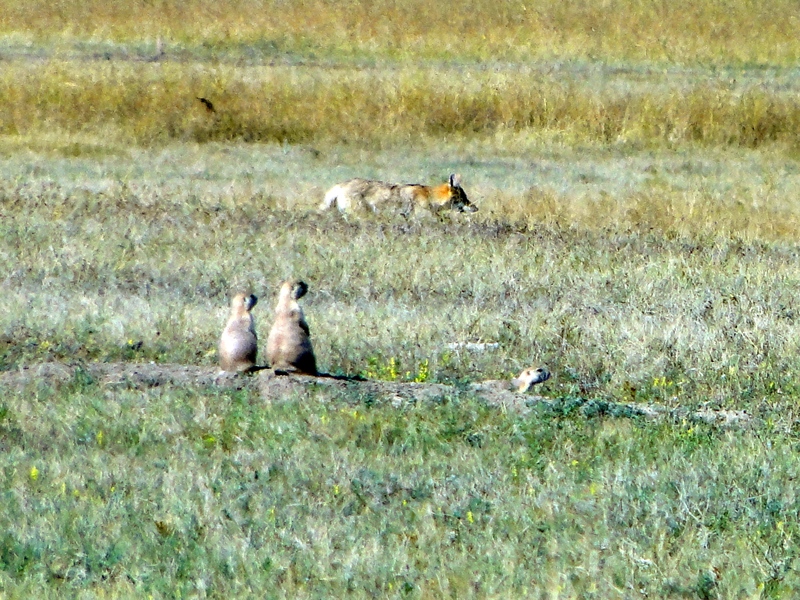 We saw mule and white tailed deer daily, more Buffalo (Tatanka) than you can imagine, Pronghorn, Burro, Bighorn Sheep, Coyote, and my personal favorite, the very cute Prairie Dog. 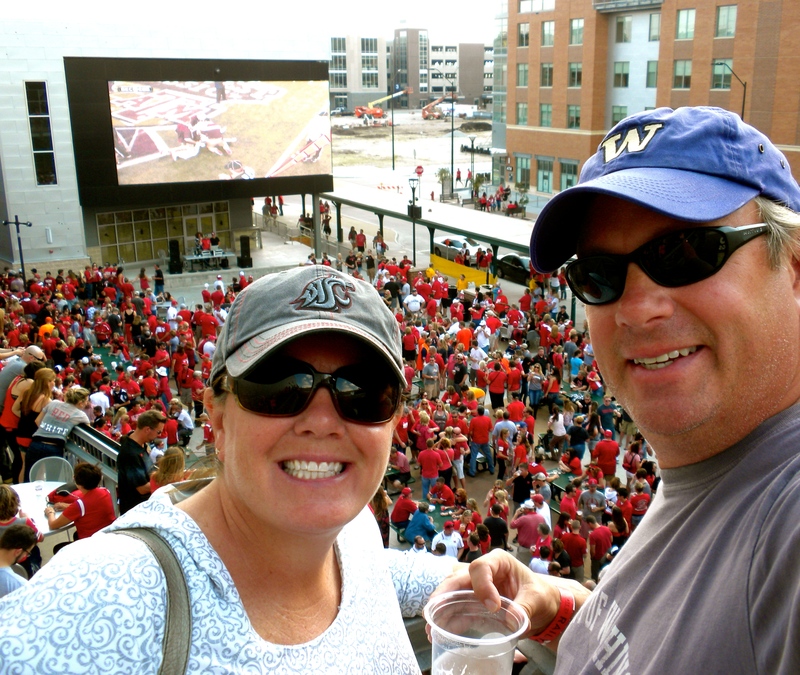 We had a great Seahwaks Sunday, watching them beat Denver in OT. The game was a bit stressful, but beings that we are in Bronco territory, it was a sweet victory! 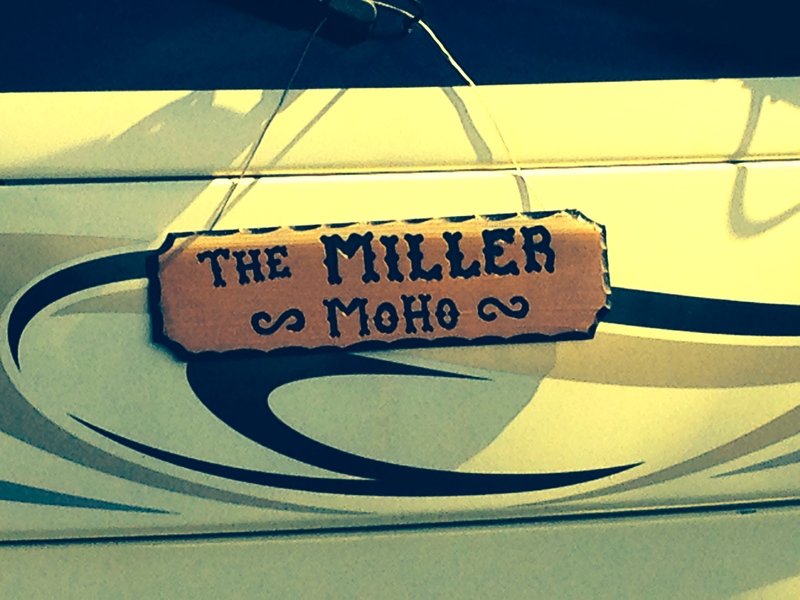 We were also able to get a much-needed MoHo wash from a great local company, Pro Wash and found a guy to create a personalized sign for the MoHo! One other random tidbit…of all the places we have been so far, we have seen more RV’s here than anywhere else we have been. It is cheap and easy to license here (you only have to stay one night in the state before you can claim residency), so we know that many fellow MoHo’ers take advantage of this and register in SD where there is also no sales tax. This was a great stop for us, and the furthest west we have been in a long time. It definitely felt like we were closer to home, even had a Safeway! 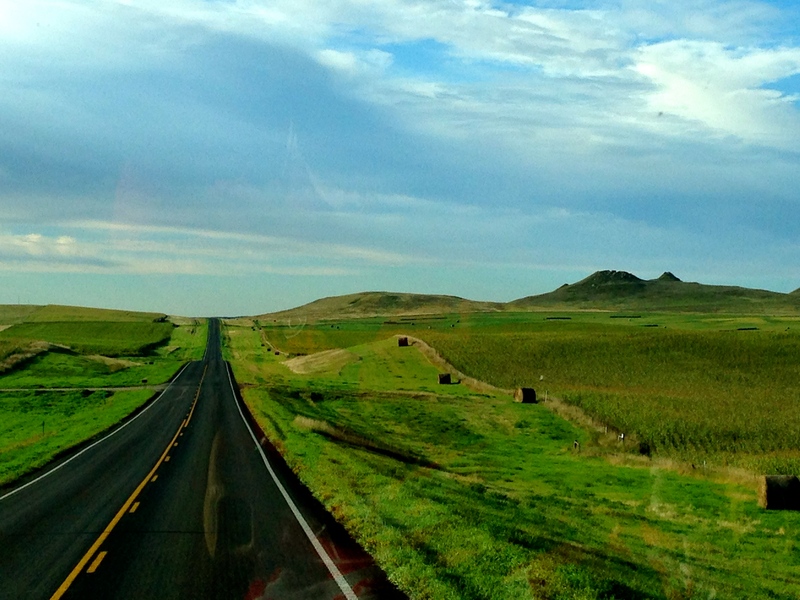 Next up is Nebraska and starting to head eastbound and Central Time. 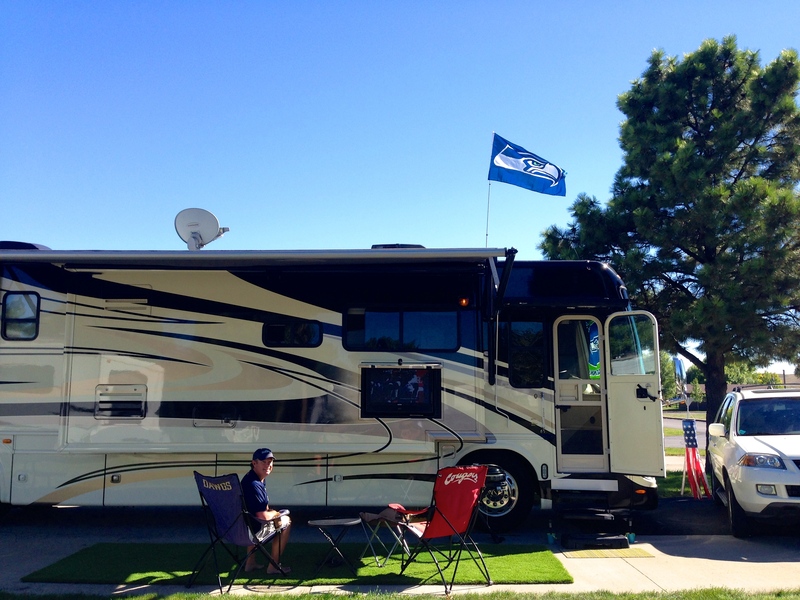 Our tailgating setup for the big game – notice our new flag! 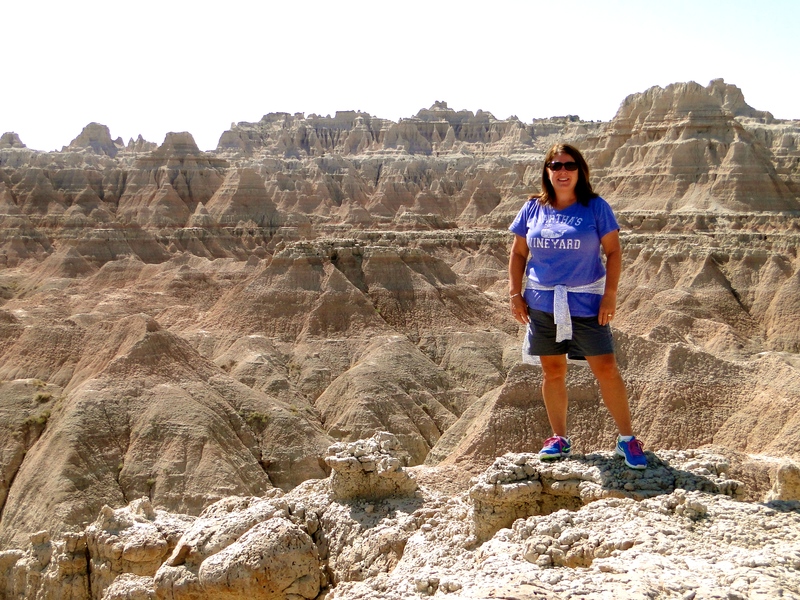 This entry was posted in September 2014 and tagged Badlands, Black Hills, Custer State Park, Deadwood, Mt. 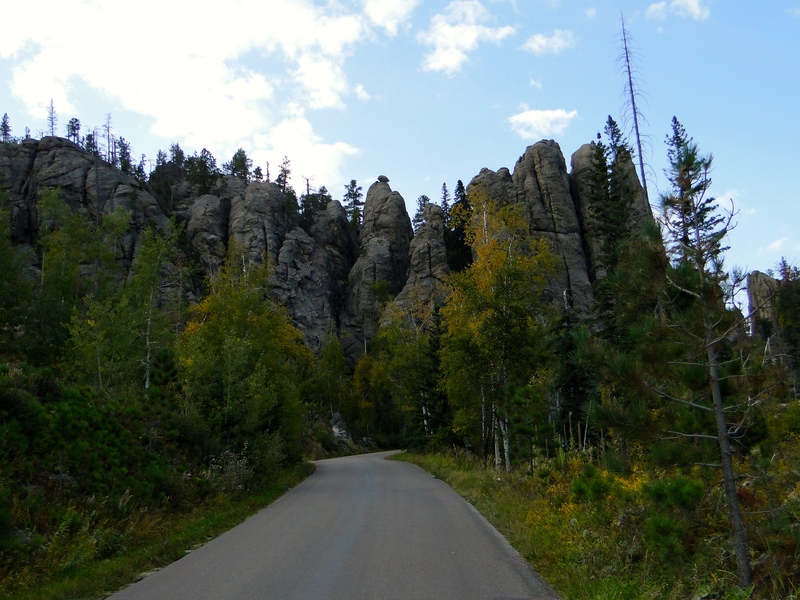 Rushmore, Needles Highway, Seahawks, South Dakota, Sturgis, Tatanka, wildlife, Wind Caves on September 23, 2014 by Traci. We headed west out of Duluth, our next destination would be Fargo, ND. The drive started out nice, a bit windy, but then a huge rain squall hit right before we arrived in Casselton, about 20 miles west of Fargo. We stayed at the Days Inn and Governors Conference Center and the park was nothing to get excited about, basic dirt and grass parking lot, just off the I-94. Lots of transient workers here, with pickup trucks coming and going all the time. 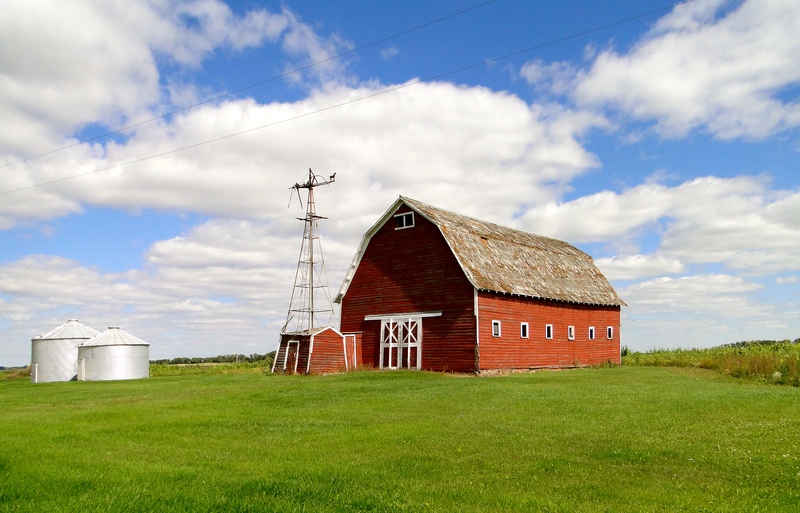 As you may be aware of, North Dakota has a booming economy with the oil drilling going on, mostly in the northern half of the state. The boom trickles down to the rest of the state providing infrastructure and jobs for everyone. As it was a Tuesday, it was Taco night in the MoHo, and we hunkered down inside and tried to relax with the wind howling all night long. Wednesday the weather was not much better, still very cold, temps in the mid 40’s, and still quite windy. A definite shock to the system, as we just left the mid-70’s in Duluth. 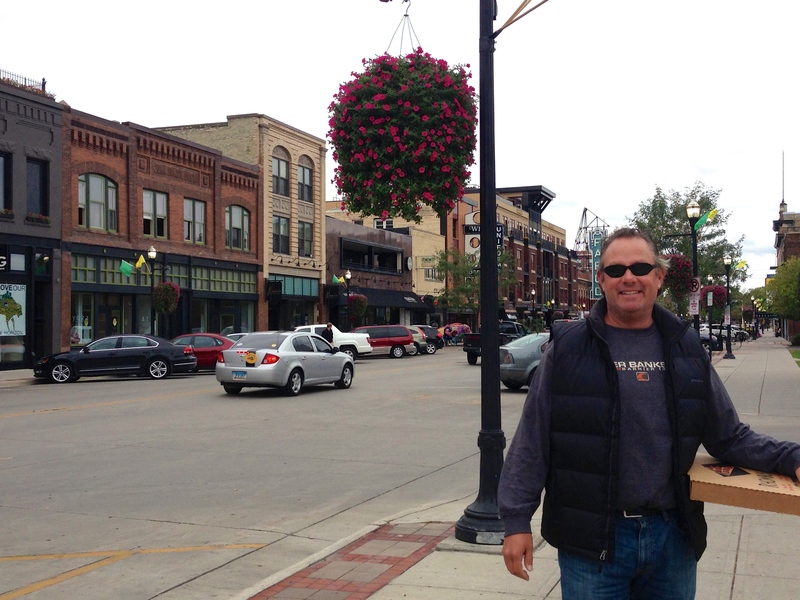 We bundled up for a day in Fargo, jeans and heavy vests to ward off the coolness. 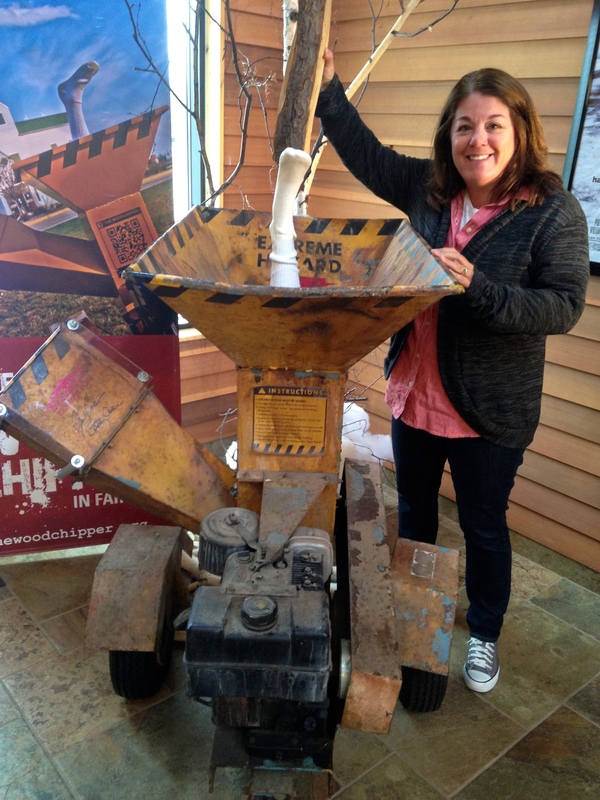 The first stop was the Visitor Center; Traci was really looking forward to seeing “The Wood Chipper” from the movie Fargo. The movie prop is in the Visitors Center, there for all to see. The staff admitted that about 50% of the people coming in are just looking for the prop. After getting our pictures, we headed into the downtown area, specifically Broadway Street, looking for some lunch. The day was drying out, but the wind was still there and temps had risen to about 50, still darn cold. We stopped at a bike shop for some parts, and they recommended a great place for lunch, Rhombus Guys Pizza. On our way back to the car after eating, we had finally clued in that Fargo was going to host ESPN’s College Football Gameday the upcoming weekend, and we could possibly attend if we stayed a few extra days. 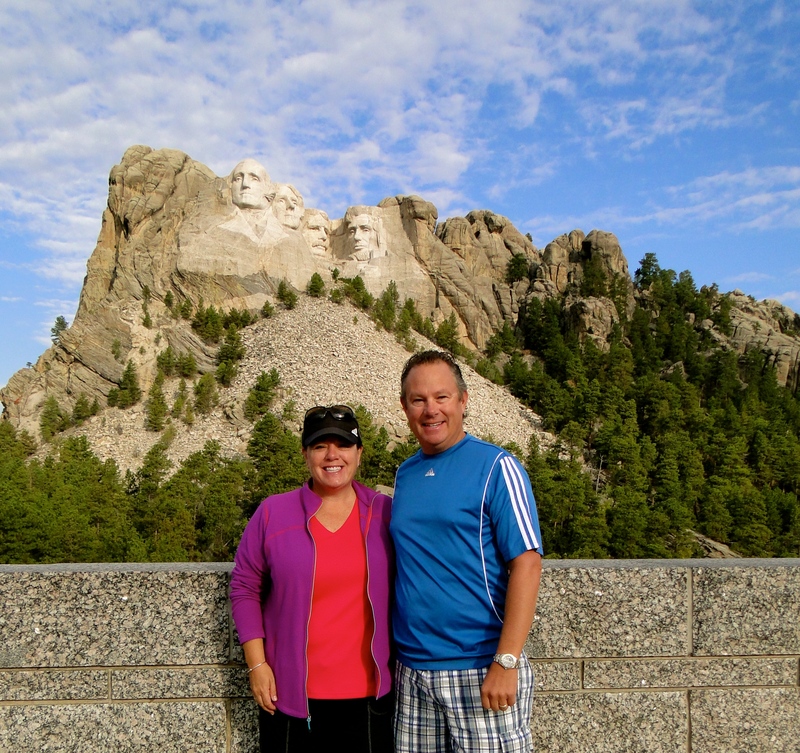 (We chose not to stay, we felt like the extra couple days may affect us getting through the rest of the Plains states with the weather quickly changing – The Black Hills just got 20” of snow, a destination just a few days away!) We returned to the MoHo, after stopping for some supplies, and again hunkered down, wind still blowing and the temps back down to the low 40’s. We actually had to turn on the heat for the first time since I don’t know when! 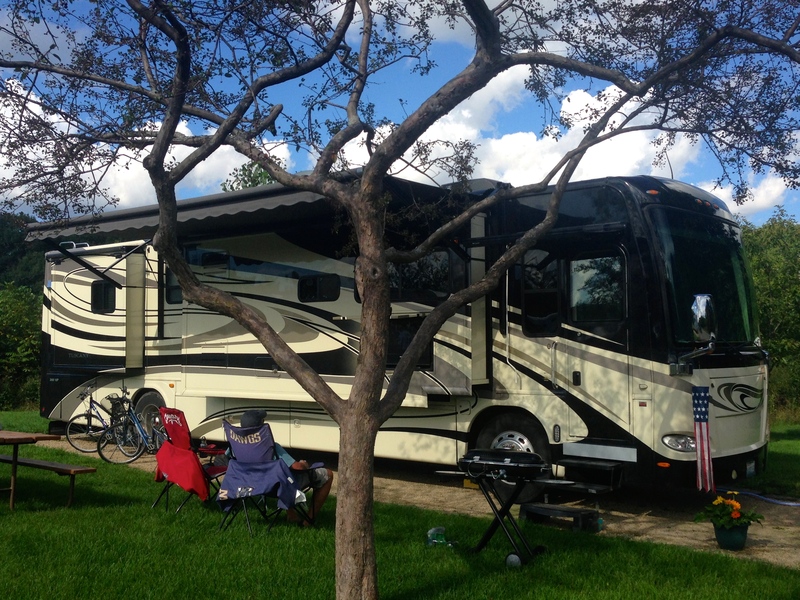 Thursday we left Fargo, and made the 190-mile drive west to Bismarck, staying at the Bismarck KOA on the NE side of town. We got set up and decided to head into town, as this was to be a two day stop so we wanted to take advantage of the short time we had here. After driving around for about an hour, and not really finding a whole lot of excitement, we returned to the MoHo and had leftovers and got an early nights rest. 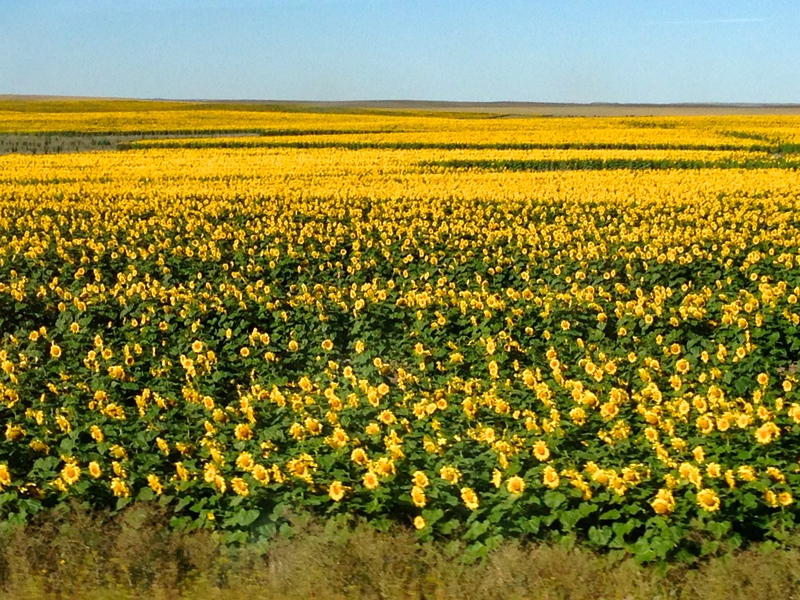 North Dakota is the leading state for sunflower oil production. There were fields upon fields of yellow. Friday we were up and out early, leaving the MoHo by about 9:30AM. We filled up the car, and started our drive North. 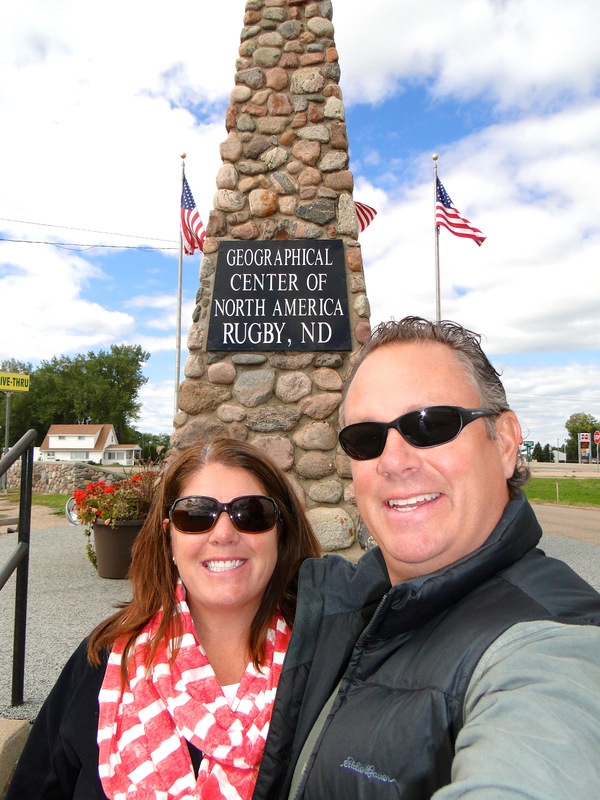 Our big reason for this stop was to make our way to Knox, ND. Knox was the town that my father’s side of the family settled in back in the early 1900’s and the family still has the farm there. I had visited it once, back in the mid 1970’s with my brother and grandparents on one of those epic road trips when you are a kid. I have talked fondly of that trip and it was on the top of my list of destinations on our journey. 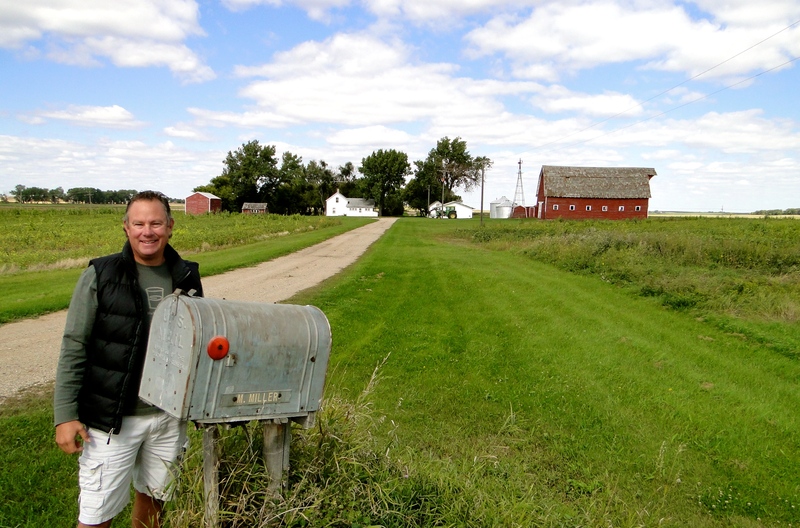 The drive was about 160 miles up from Bismarck, and it took us through a lot of long straight roads, with lots of little ponds and lakes everywhere with fields and farming mixed in. Very peaceful part of our country and not a lot of people, just a lot of wide-open spaces. We first stopped in Rugby, and found a little greasy spoon for a good old-fashioned roadside lunch. The food was good, and it was clear we were not from around there, everyone seemed to know each other, small town America. We then headed east for the last 13 miles to Knox. 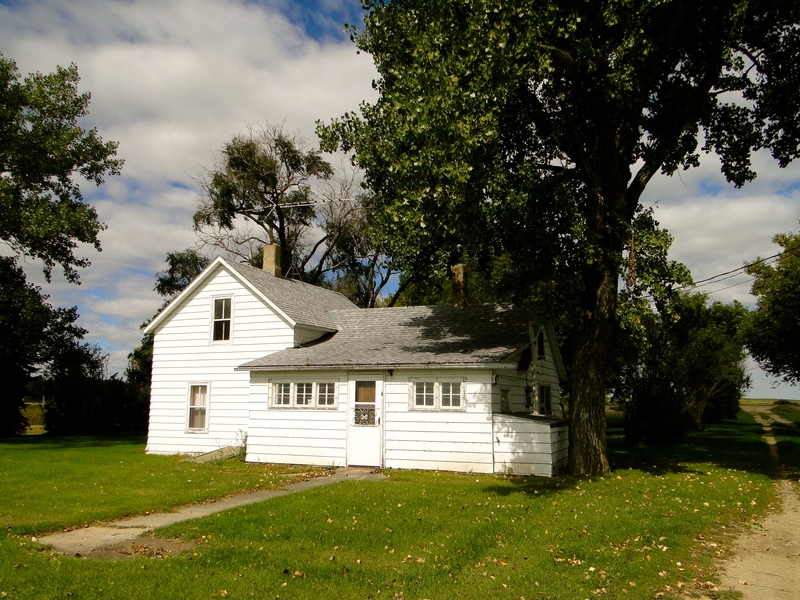 I had done some research on the town, and it was now featured on a local website of Ghost Towns of North Dakota, as most everyone had left. At one time there were over 300 people living there, now it is down to 12. 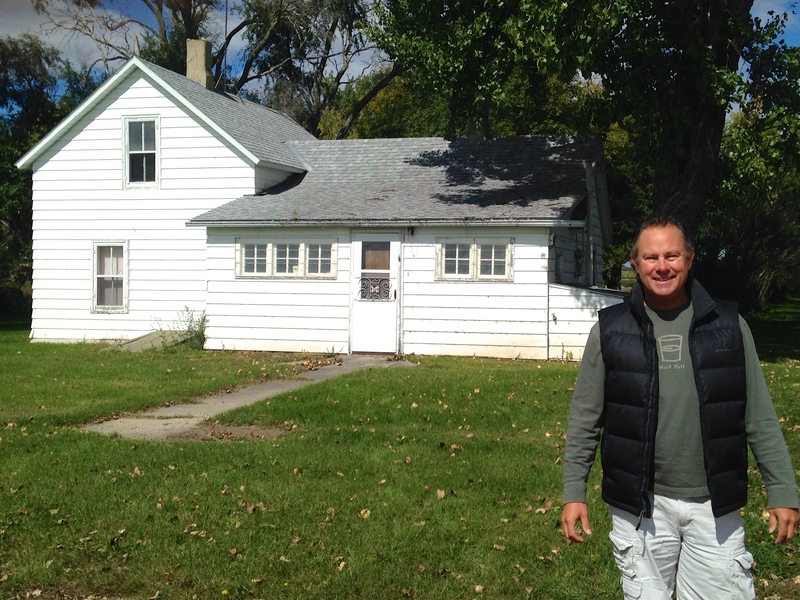 I drove straight to the farmhouse I had visited some 35+ years ago, and it looked just as I remembered! 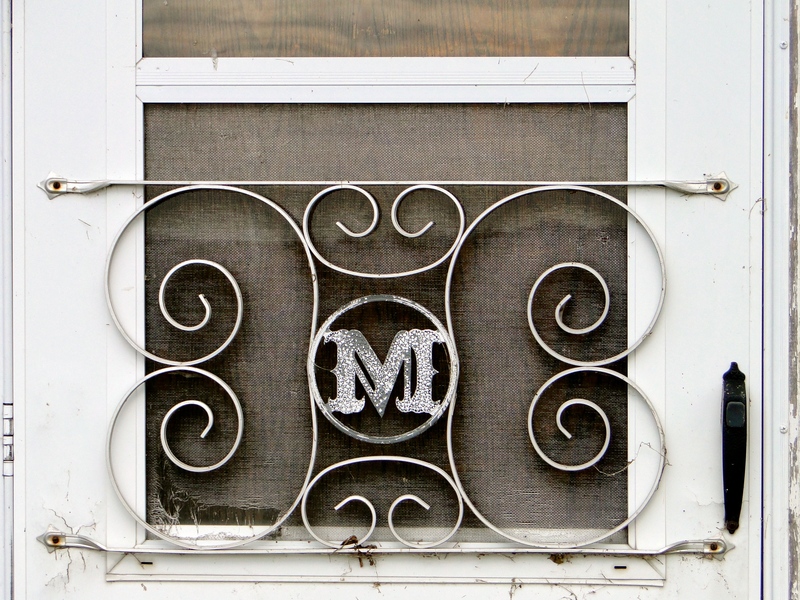 My Great Aunt Maggie was the last member of the family to reside here, and she had moved out about 3 years prior. The farmhouse and property have been maintained by some of the distant cousins, there were originally 15 children raised here by my great grandparents, what a feat! I knocked on the door, and soon realized the place was vacant. Peering in through the windows, it still had the same charm I remembered, just no furniture or people living there anymore. Traci and I walked all around the yard, taking pictures and exploring the property I had fond memories of. We then drove the empty streets of Knox, stopping for pictures here and there, but it was very quiet. We were looking for the cemetery, but could not find it. We turned down another street and I noticed a car was now parked that had not been there a few moments prior, and there was a man working in a garden. We stopped and I introduced myself, and he finally realized I was not there to try and buy some cheap housing, I guess everyone is trying to buy up properties hoping the oil boom will make for some quick bucks in the real estate market. He took us into a cabin he had across the street and gave us a lot of interesting opinions on the area and the world, quite a talker. We left after an hour or so, with a full bag of fresh tomatoes, and headed in the correct direction of the cemetery. Buried there are my great grandparents Michael and Katherine Miller, grandparents Michael and Hazel Miler, and Aunt Maggie. A special little town, one that I will never forget, even if it has all but been abandoned. We made our way back to Bismarck, returning on a different set of roads, but still the same peaceful ponds, lakes and fields, a very good day to say the least! 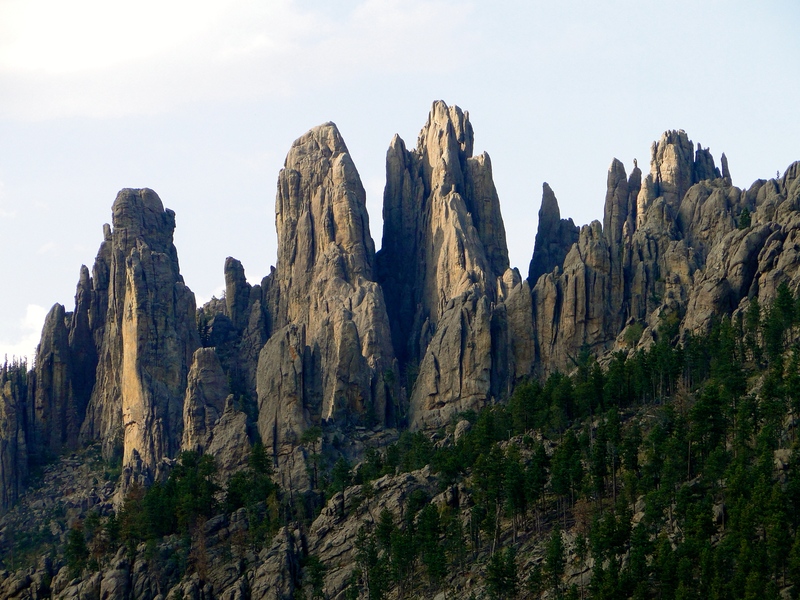 Next we head to Rapid City, SD, a long 325-mile drive. This entry was posted in September 2014 and tagged family farm, Fargo, Knox, North Dakota, Wood Chipper on September 15, 2014 by Mike. First I must say, who can believe it is September already? 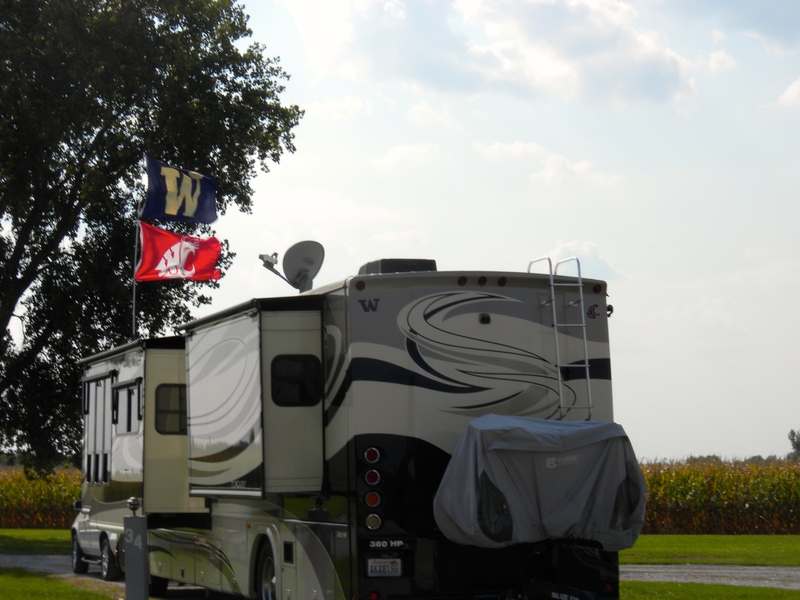 I am starting to feel Fall in the air and of course it is football season!! 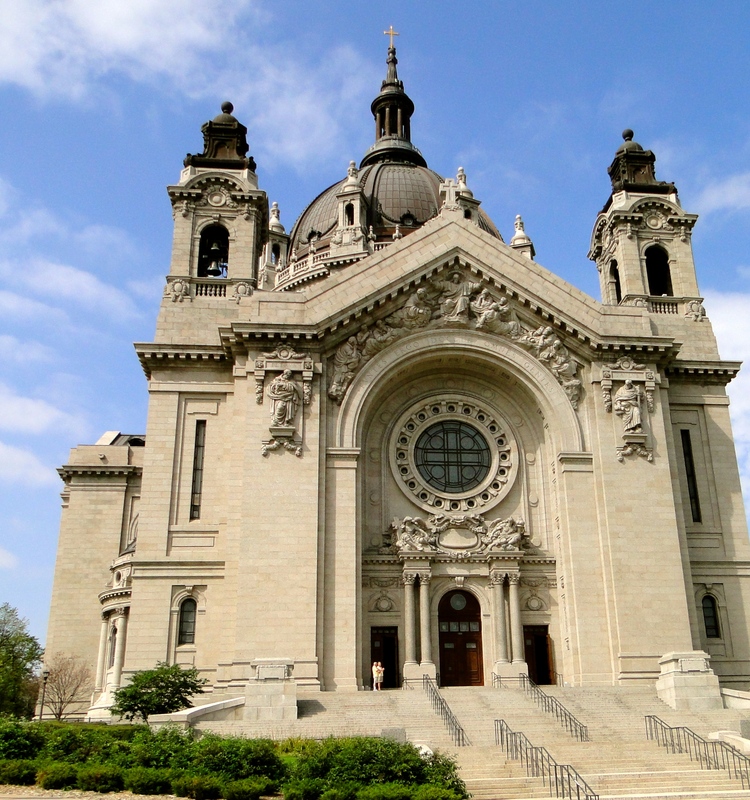 Minnesota was a new state for both of us and we were excited for it as we got some great recommendations from Steve as he grew up in the Twin Cities. 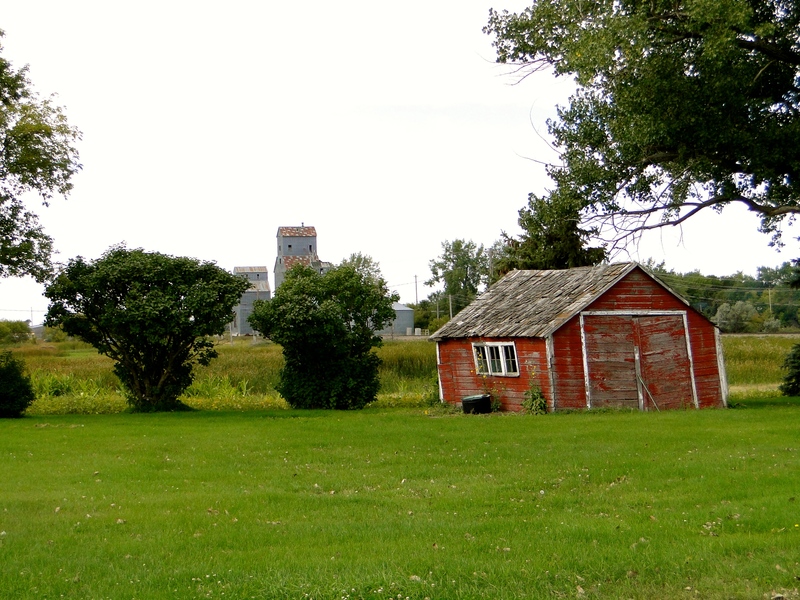 Our first stop was in Apple Valley, which is just south of Minneapolis and St. Paul. Lebanon Hills Campground was our home for five nights and it was our favorite campground in quite some time. It was the perfect mix of feeling like we were camping and all of the amenities we have come to like at nicer RV Parks. Our first couple of days here were full of rain, thunder & lightning so we hunkered down and didn’t do a whole lot. Plus, I had developed a sore throat so it was nice to lay low. Interestingly, neither one of us have been sick for the past 16 mo’s, compared to at home where we would pick up something easily from work. It didn’t last long thankfully. Finally the weather cleared and we were ready to head out to explore. Our first stop was at Matt’s Bar for lunch, home of the original Jucy Lucy (yes, spelled correctly). It is a burger with the cheese on the inside of the patty. Actually I think it is two patties formed together with a slice of cheese in the middle. When they come out the cheese is “like molten lava” so it is important to let it cool. Mike & I split one and I must say it rivaled the burger we had in New Haven, CT at Louis Lunch. 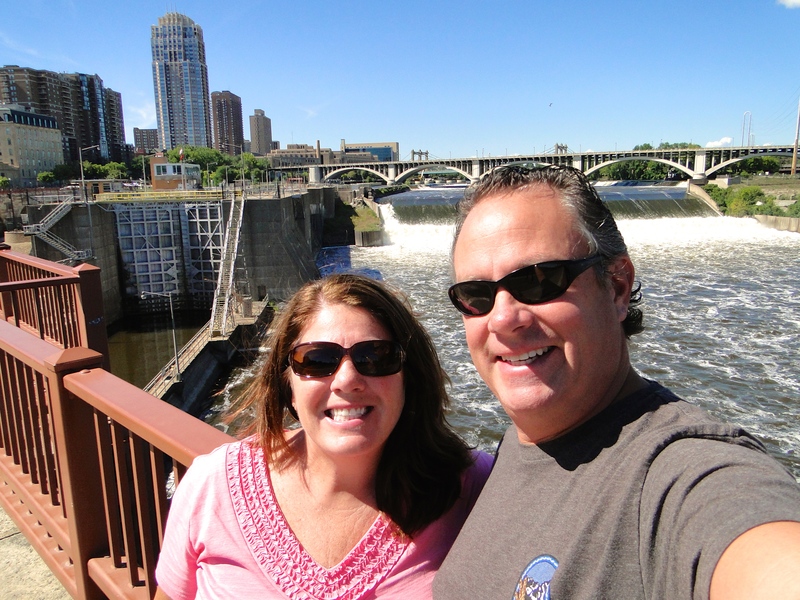 We headed into downtown Minneapolis and the riverfront (I didn’t realize the mighty Mississippi originates in MN) and walked out along the many paths and locks system. 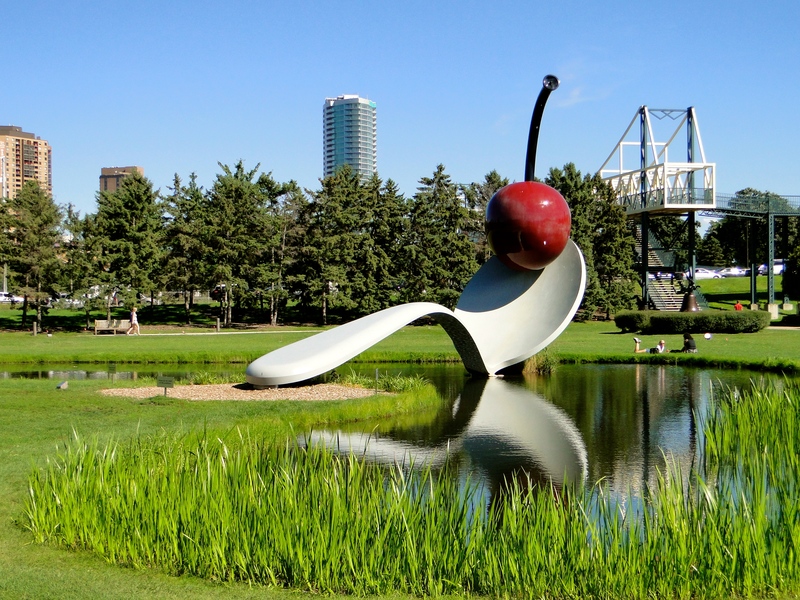 We had some time to kill before the ballgame, so checked out the Sculpture Garden, then got a bite to eat along the riverfront. 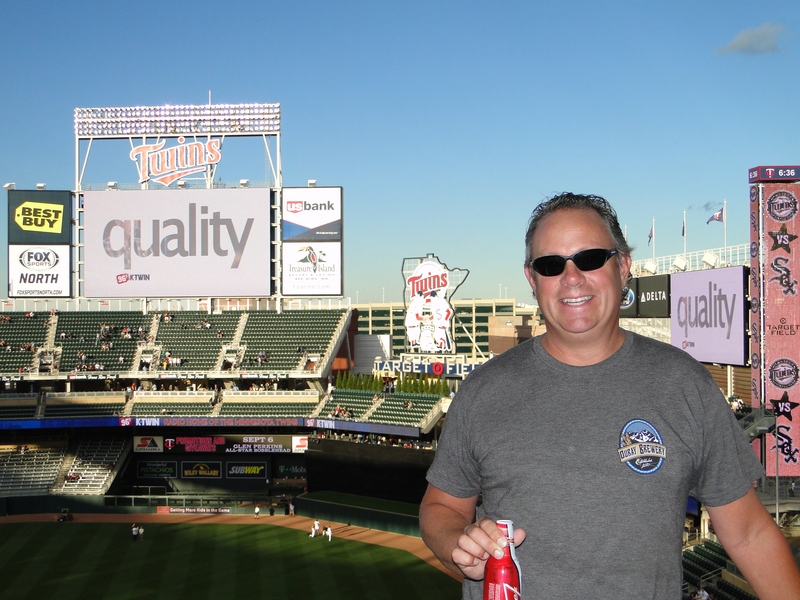 We headed over to Target Field and decided to just go in early to check out the stadium, as we weren’t able to find a fun fan area to check out. Disappointing, as this is part of the whole ball field experience for us typically; maybe we just missed it. 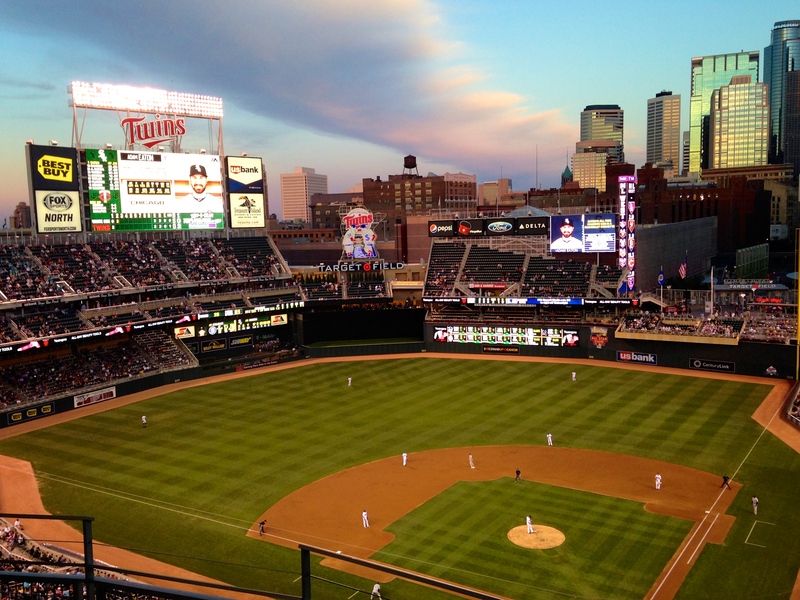 The Twins were playing the White Sox and it was a pretty boring game and very empty. It was a nice modern stadium though right in the heart of downtown with great cityscape views. We got back to the MoHo in time to watch a more exciting team, the Mariners – it is fun to actually have them be in playoff contention! The next day brought more rain, so we relaxed in the morning then checked out a Triple D restaurant for lunch, Pizzeria Lola. They make thin crust wood-fired pizza’s with cute names; Mike had the “My Sha-Roni” and I had the “Hawaii Pie-O” complemented by craft beers. A great place, a bit pricey, but we loved it. It was funny, our waitress was from Shoreline. We get a lot of inquiries of where we are from when we hand over our Alaska Airlines credit card to pay. The weather wasn’t great, so we decided to hit the Mall of America. 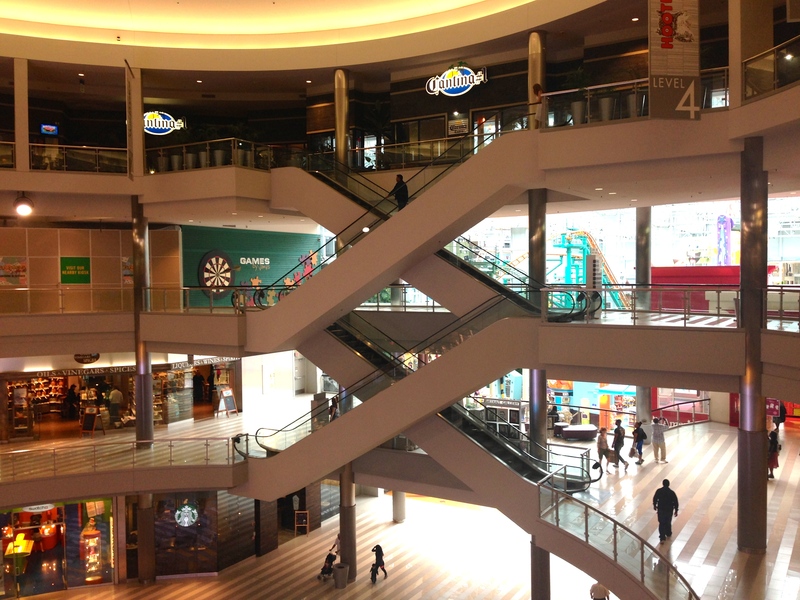 This place was huge, five stories and the middle section was basically an amusement park. We actually walked around for a few hours but didn’t purchase anything; glad we came and saw. It still amazes us how volatile the weather is: rain, lightning, sun, rain, lightning, sun. 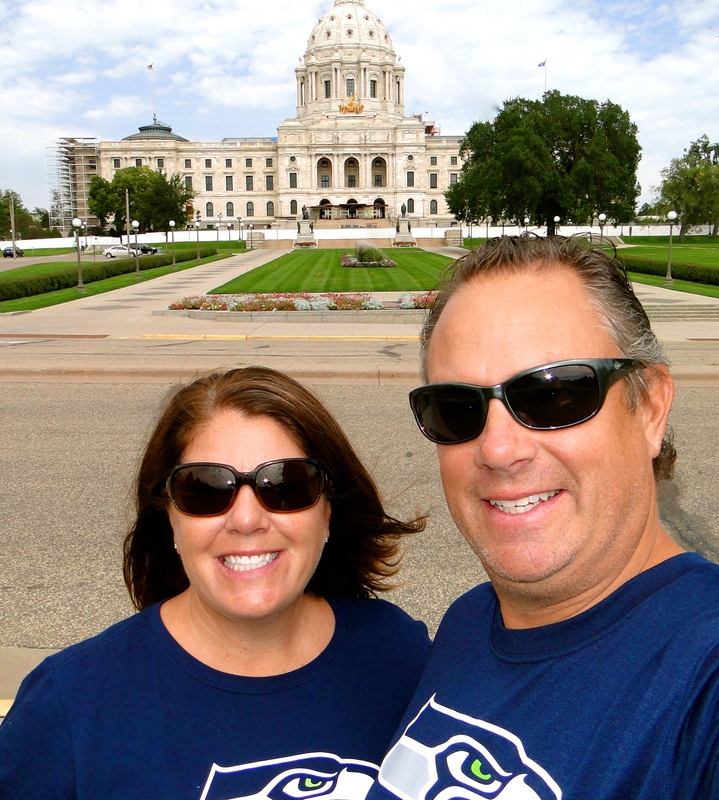 We headed into St. Paul for the day, the other half of the Twin Cities, kind of like Seattle to Bellevue. 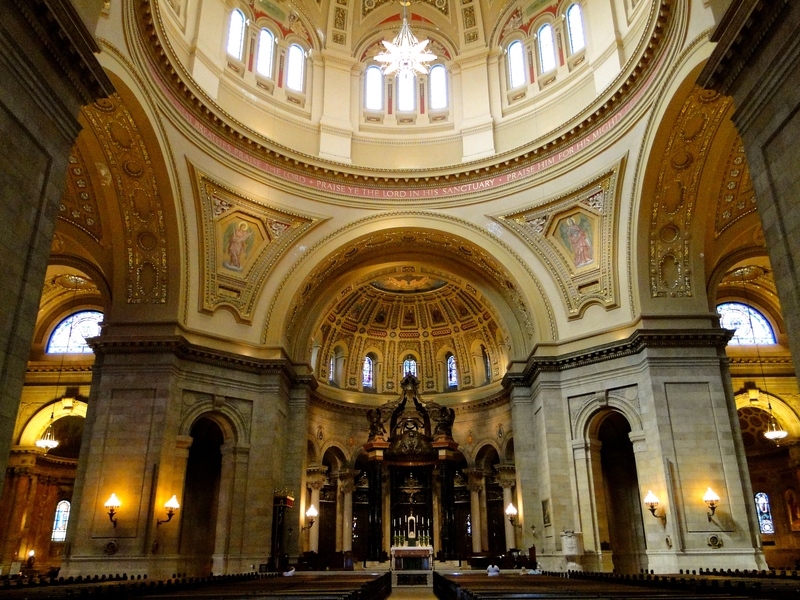 We first drove to the Cathedral of Saint Paul. This thing was massive and beautiful, hard to get a photo to capture the size. 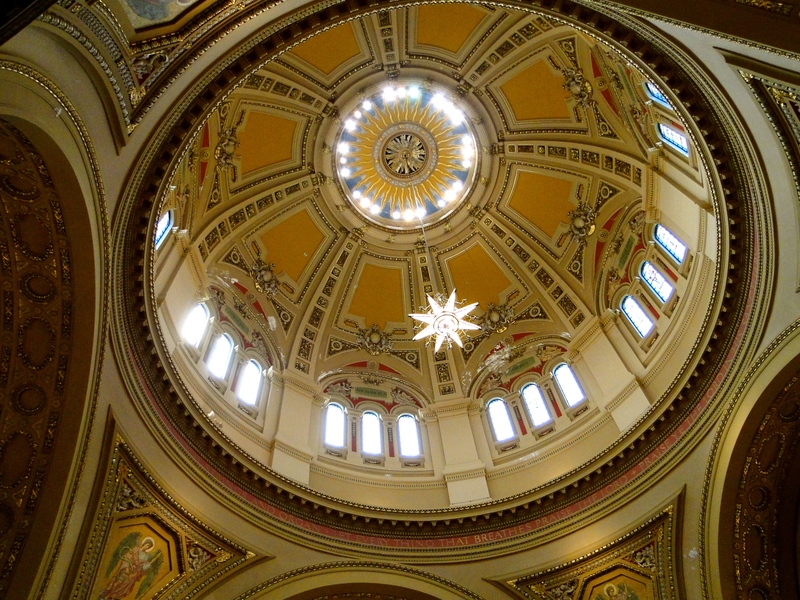 The interior was absolutely gorgeous with stained glass everywhere and a very tall dome in the middle. It reminded us of what you would see in Italy. We drove through the capital area and snapped a few pics, then it was time for lunch. We headed to one of Steve’s recommendations, Cossetta’s. It is basically a huge complex featuring a cafeteria-style food line (all freshly prepared), dessert shop, sit down restaurant and an Italian grocery with all kinds of authentic Italian items. After a delicious lunch, we headed into the dessert area to get pistachio gelato for me and then into the store to shop for a few items. We loved this place and would frequent it often if we lived here. Great suggestion Steve! We drove around town a bit more, up Grand and Summit Ave’s to see the huge mansions, then decided to head back to the MoHo. The Seahawks started at 7:30 and we had a party for two watching them pull out the victory vs. Green Bay. I do miss being at home with all of the hype and excitement that I’m sure must be happening in Seattle. 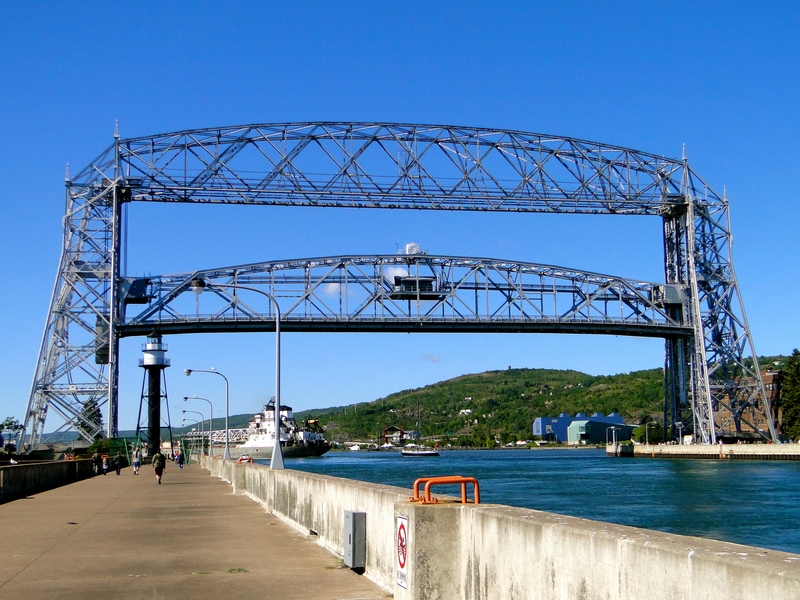 Our next destination was Duluth, MN. This was not even on our radar, but Steve suggested it to us, so we decided to check it out. 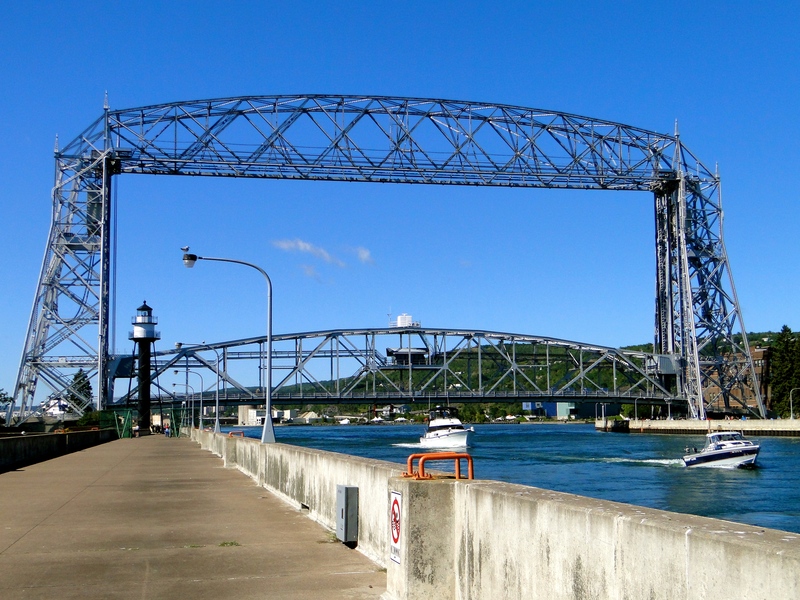 Our campground was in a marina on Park Point, Lakehead Boat Basin and Campground, located across the iconic Aerial Lift Bridge from downtown Duluth. The park was nothing special, basically a blacktop parking lot, but it had full hook-ups and the location was the best part. Kind of like our park in Jersey City, not that I’m comparing Duluth to NYC : ) The weather was absolutely perfect and no humidity! We didn’t expect that we would be back on Lake Superior anytime soon after the U.P. of Michigan, but here we were! We got set-up and when we checked the TV/Satellite, we noticed we didn’t have any sound out of the main TV. This happened one time before and we just had to jiggle a few connections, but this time that didn’t work. The time had come to replace the HDMI cable, we knew this day was coming and we were dreading it. We headed out to explore and picked up a new cable and decided to just tackle our project. After over three hours of battling with working in an extremely small space and limited tools to hook-up this new cable, it still wouldn’t work. The final straw was to call DirecTV and try to schedule a tech to come out. After awhile on the phone (and basically being told that the only place a tech would come would be to Bellevue, WA – they don’t or won’t understand that we are on the road), finally he had us unplug the TV and reset the Genie and voila, it worked! We poured stiff cocktails and sat down at 9:30 to watch the Cougs blow it against Reno (0-2, really Cougs?). Not a great first day in Duluth, but we were optimistic about the days ahead as it seemed like a great town and the weather was looking to be perfect. We woke up excited to head out and explore on our bikes. We made the short 3 block ride to the bridge and it was up to allow for boat traffic, so we rode out to the end of the breakwater to take it all in. I was surprised at how many people were out to watch, but it was a gorgeous Saturday morning, and there was a huge freighter coming through. 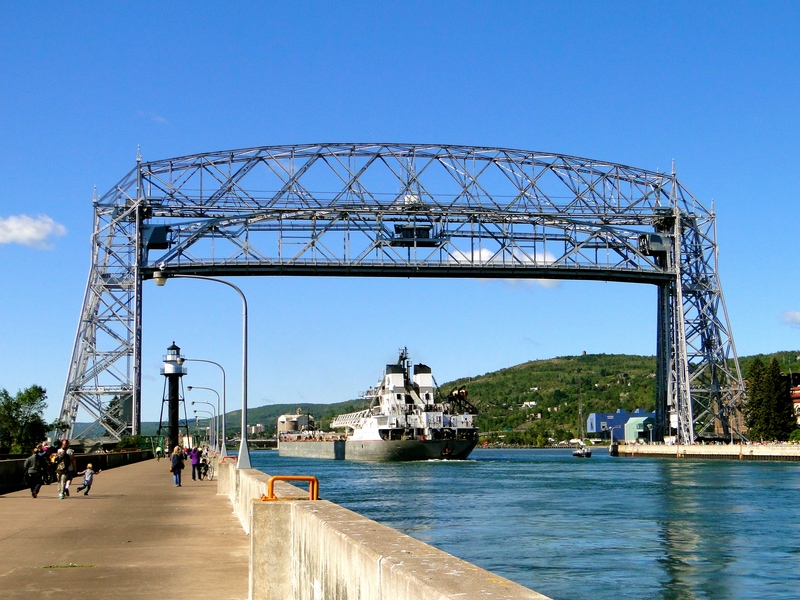 The Aerial Lift Bridge is Duluth’s most famous landmark and raises dozens of times a day to let boat traffic through. Over the course of the next few days, we saw this multiple times and it never seemed to get old. 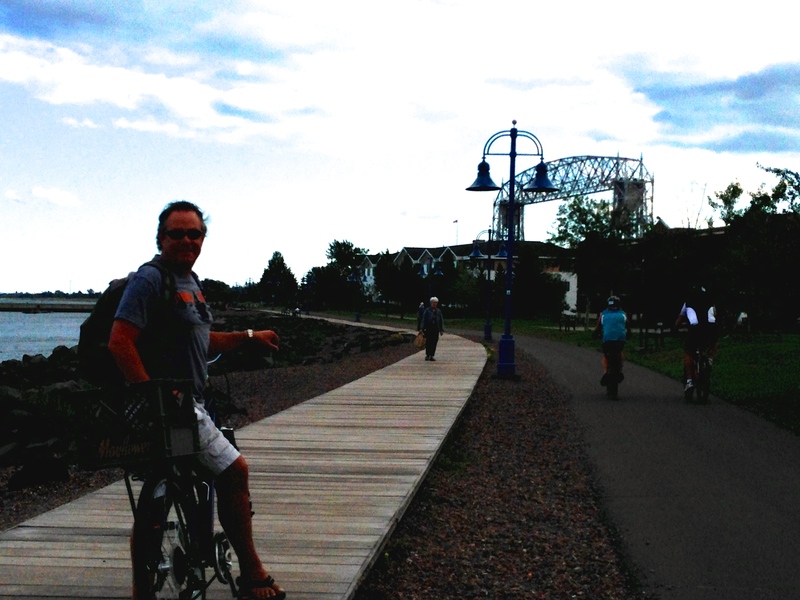 We headed down the path along Lake Superior along with many other joggers, walkers and bikers, a great trail system. Next, we rode over to Bayfront Park where there was a local festival going on. The night before there was actually an outdoor concert that we could hear at the MoHo Park. We made our way to the Farmer’s Market area and loaded up on local goodies including some Amish-made baked goods, which were out of this world! Since the MoHo was so close, we rode back and dropped off our haul, then cruised back to Canal Park Brewery for lunch and some local beer. 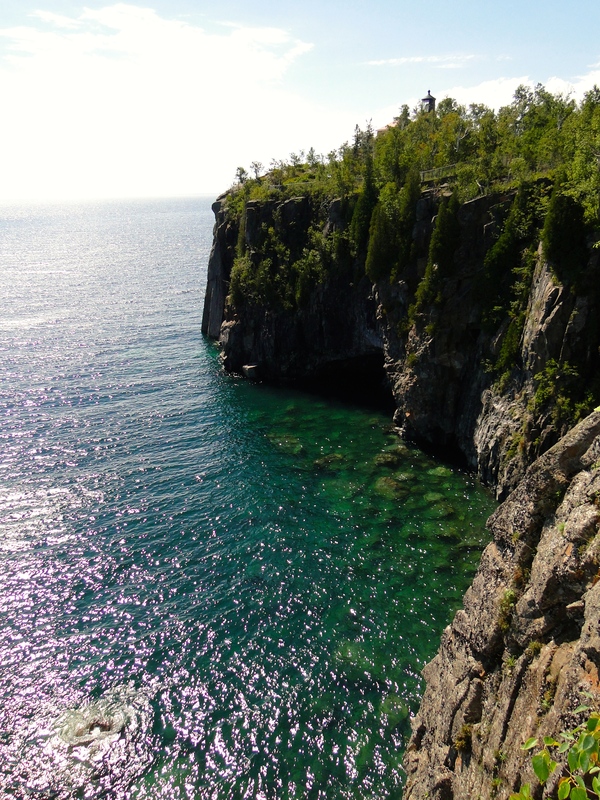 This placed was packed and full of energy with a great outdoor patio looking out on Lake Superior. Loved it. It was time to head back to the MoHo and set up our chairs outside to enjoy the sunshine and watch some college football. Unfortunately the Huskies won, otherwise it was a glorious day. We BBQ’d steaks and had local sweet corn for dinner. 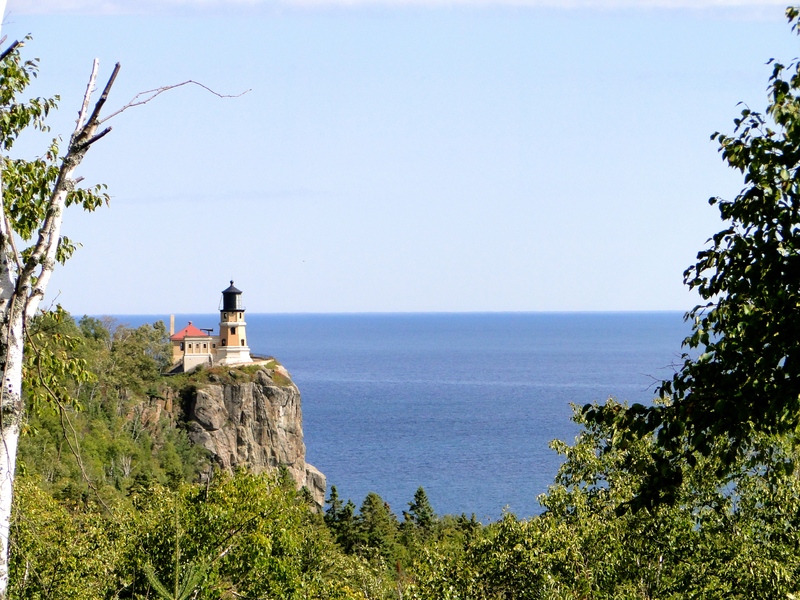 The next day we got on the road up the scenic Hwy 61/North Shore to the Split Rock Lighthouse, about an hour drive. 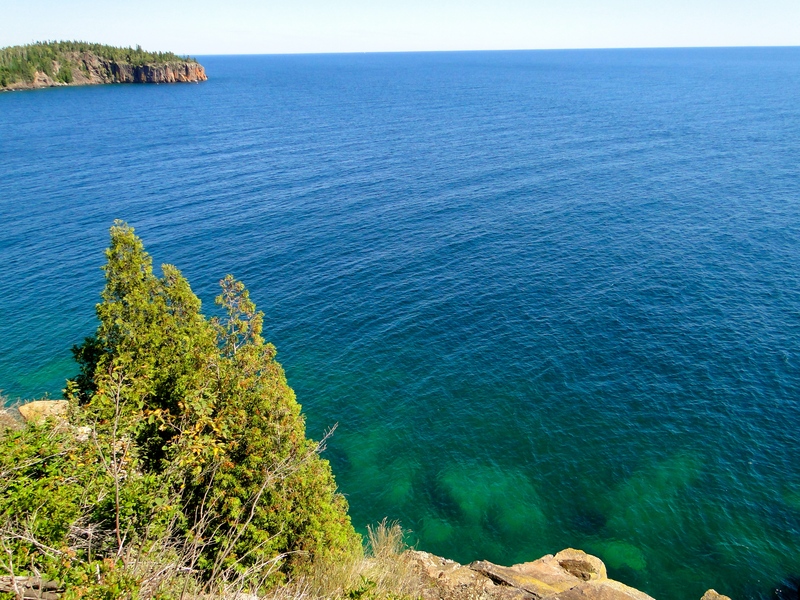 Much of the drive was along the rocky shores of Lake Superior with stunning views. It was Sunday, and the road was busy with MoHoers/Trailers heading back up to Ontario, Canada only about 150 miles away. We got some really great photos and explored the lighthouse area, then drove a bit further up the road before turning around and heading back. We stopped for groceries on the way back to the MoHo for a relaxing Sunday watching football and BBQ’ing. With the entire surface frozen (which has only happened twice), there would be enough space for every person on earth to spread out a 12’ x 12’ picnic blanket. Wow, hard to fathom how huge this lake is. We learned that this last winter with the Polar Vortex, over 90% of the lake froze; a typical year is 30%. On our last day, we decided to head across the river to Superior, Wisconsin. Actually, it was a waste of time, not much to see, so we headed back to Duluth for lunch at Fitgers, another brewery. We drove back to the MoHo to park the car and set back out on our bikes for one last cruise around town. Since it was a Monday, it was much quieter and the wind was starting to kick up, with bad weather anticipated for the next day. 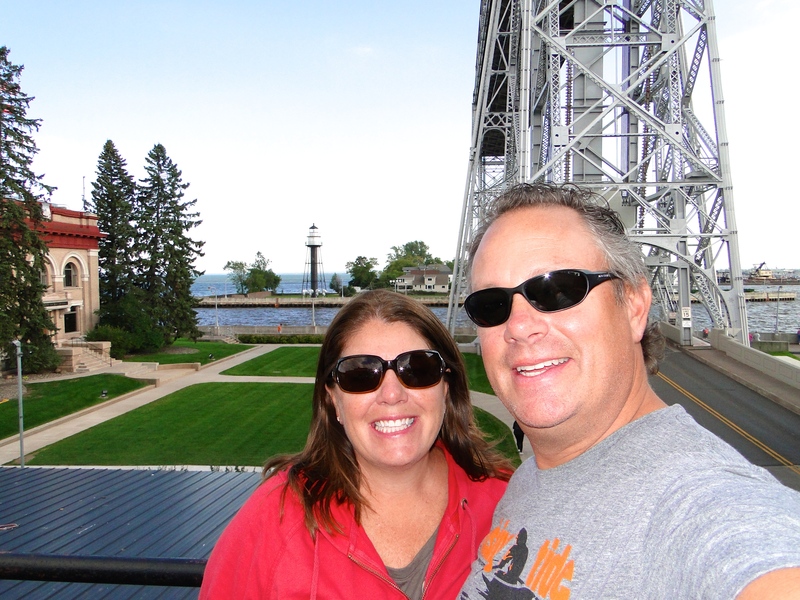 We headed back to Canal Park Brewery for Mike to get a growler of their Stoned Surf IPA, then a last beer on Grandma’s Deck with great views of the Lake and Bridge. We headed back to the MoHo to pack up the bikes and outdoor stuff in preparation for our departure in the morning. We really enjoyed this stop. It was great to ride our bikes around town and not worry about parking. I know the weather made a huge difference too, but also the fact that we had no expectations and we were pleasantly surprised. Love it when that happens! We are both feeling pretty relaxed. Thank you Duluth! Next stop is Fargo, ND. This entry was posted in September 2014 and tagged Aerial Lift Bridge, Bike Riding, breweries, Crazy Weather, Duluth, Jucy Lucy, Lake Superior, Mall of America, Minneapolis, Minnesota, Mississippi River, St. Paul, Target Field, Twin Cities on September 9, 2014 by Traci.